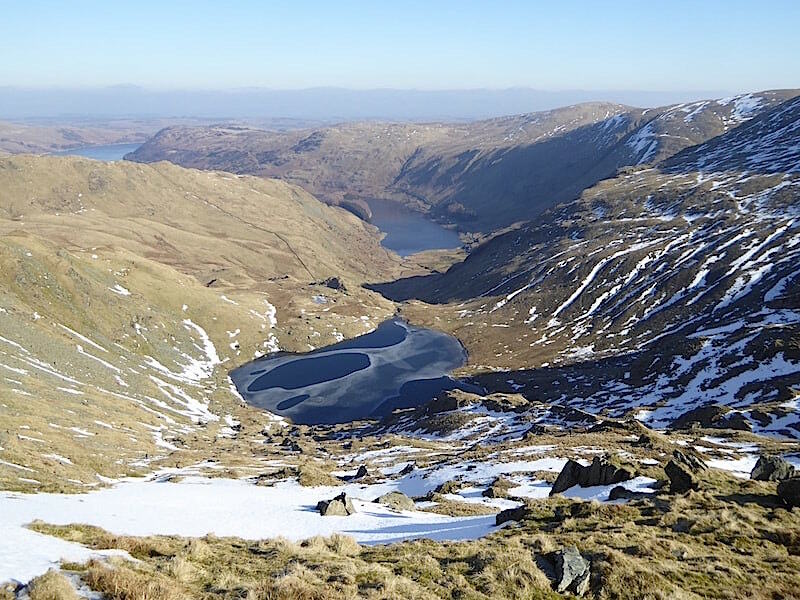 The spell of dry and settled weather continued today and with the forecast of more snow and even colder and windier conditions arriving from Siberia in the coming week we decided to take the opportunity to return to a favourite walk of ours and take a tramp across the high fells overlooking Haweswater while the weather was still set fair. A very deep frost last night involved a fair amount of ice having to be removed from the car windows before we could get going, but thirty minutes or so after leaving home we are parked up at Mardale Head car park where a dozen or so others are already parked, their occupants either already heading for the hills or going about the business of getting ready to do so. 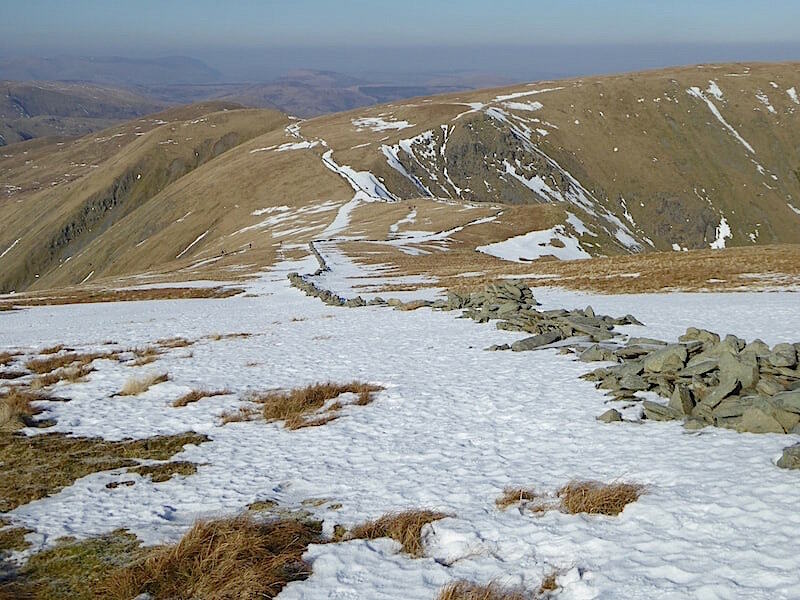 Looking around we can see quite a lot of snow still lying around up there and, as the path up to Small Water can often be quite wet and will definitely be frozen over today, we put the spikes on from the off. 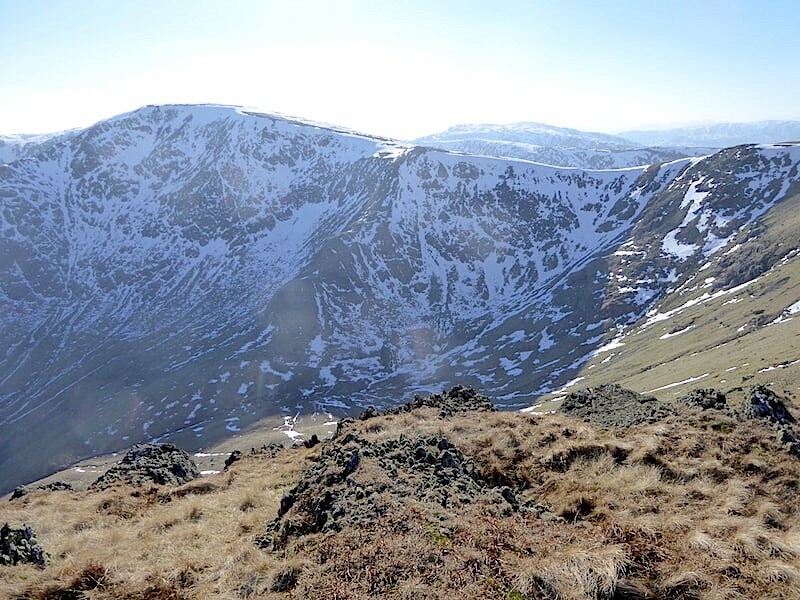 Once we are kitted up we head towards the gate close to which I took this shot of Mardale Ill Bell, the east ridge of which is jutting out into the shadow across the middle foreground. 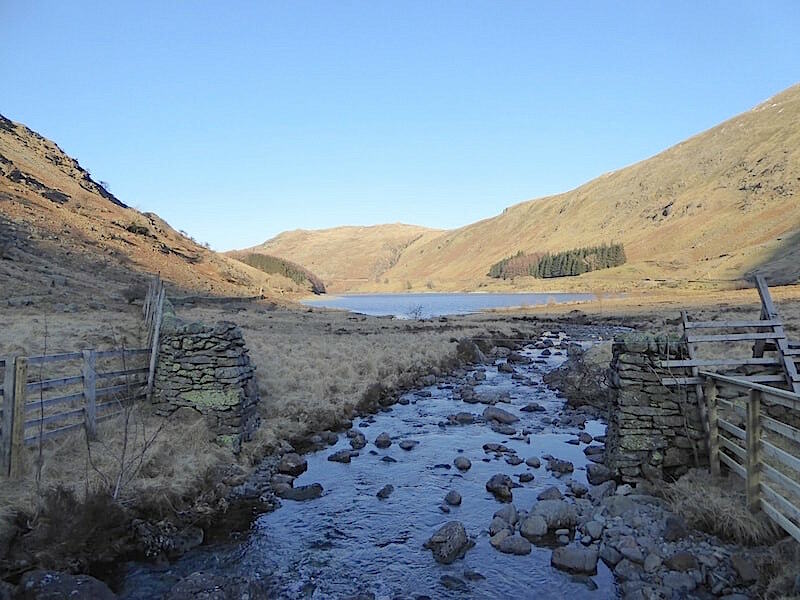 We follow the Small Water route and a short distance along it I took a look back at the view along Haweswater towards The Rigg, on the left, with Mardale Banks and Brown Howe beyond. 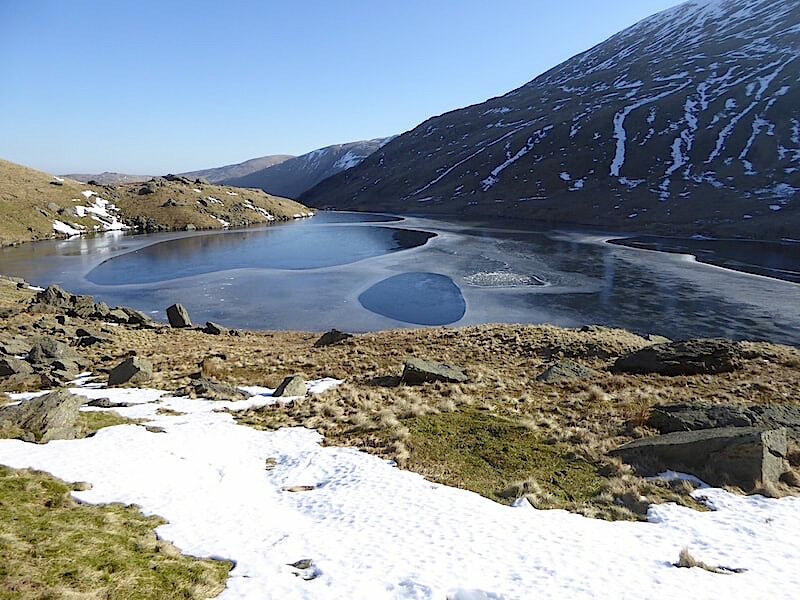 There’s no wind at all down here so the water is very still and slivers of surface ice can be seen here and there, and its nose nippingly cold in the shade. 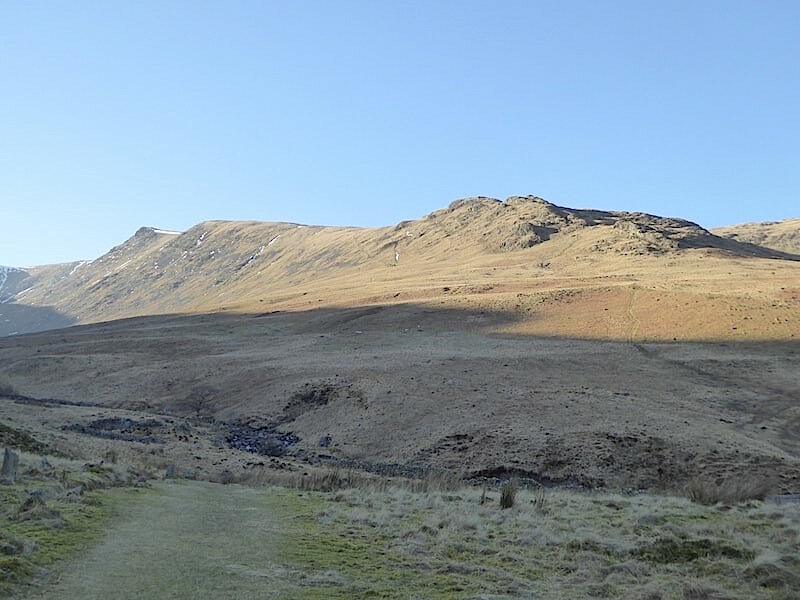 We reach the sunny uplands further along the path where the sun is blazing down on us through Gatescarth Pass between Branstree and Harter Fell. 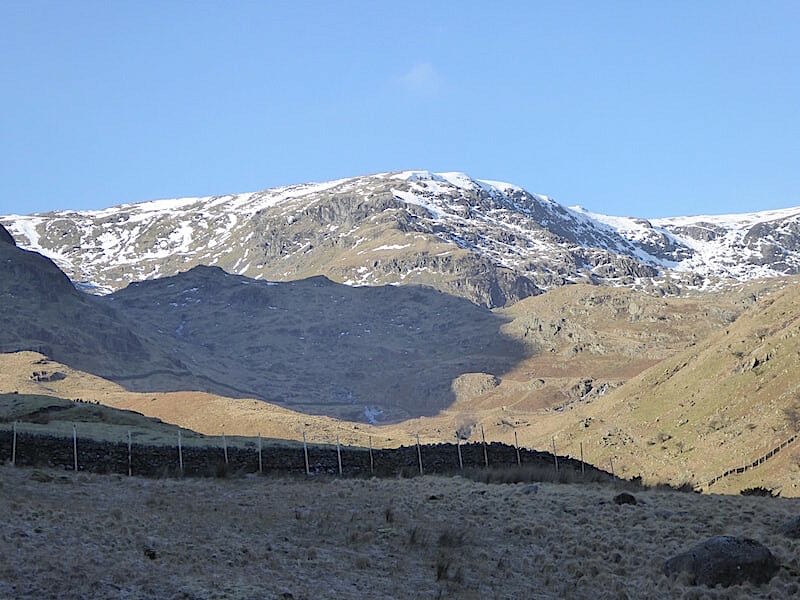 The ground is hard and icily solid and even the grass is frozen, but little by little our body heat rises as we negotiate the deep and frozen ruts along the path and pick our way over the stones and rocks rimed with frost. 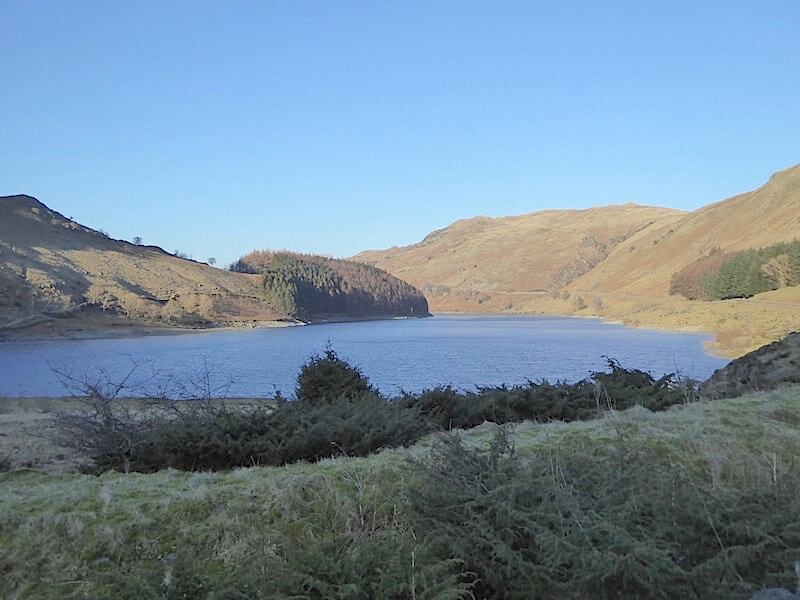 By the time we reached the deer gate I was beginning to feel like a steamed pudding and my jacket just had to come off. 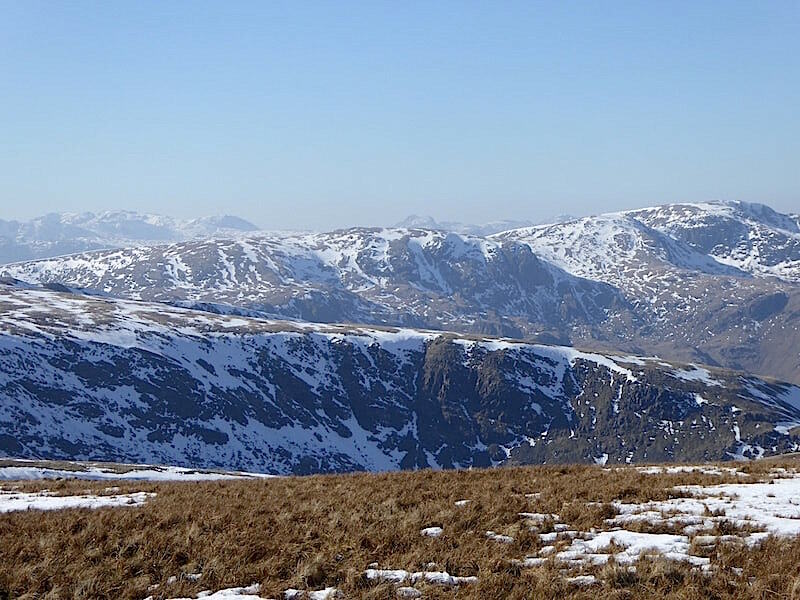 The deep shade provided by Harter Fell a little further ahead couldn’t come soon enough for me. 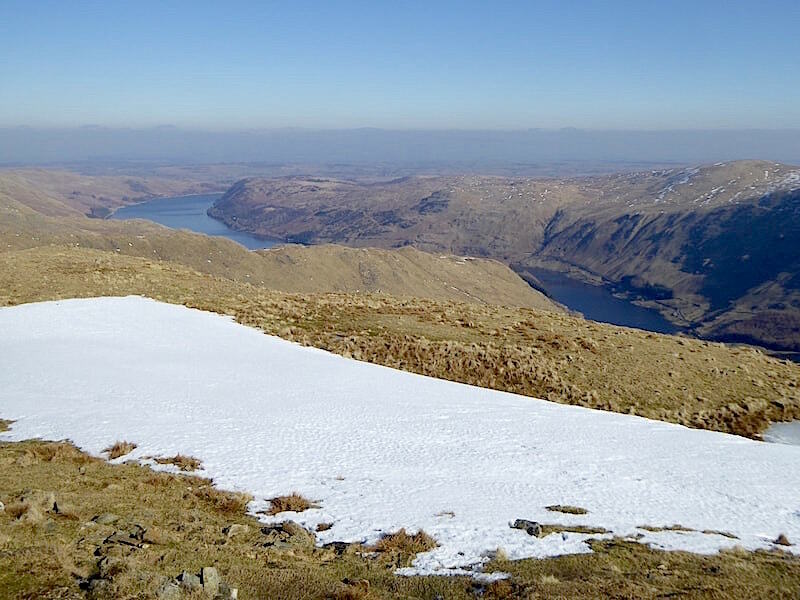 Now we’re that little bit higher, on our right we begin to see the High Street plateau to the right of Mardale Ill Bell, with plenty of snow still up there by the looks of things. 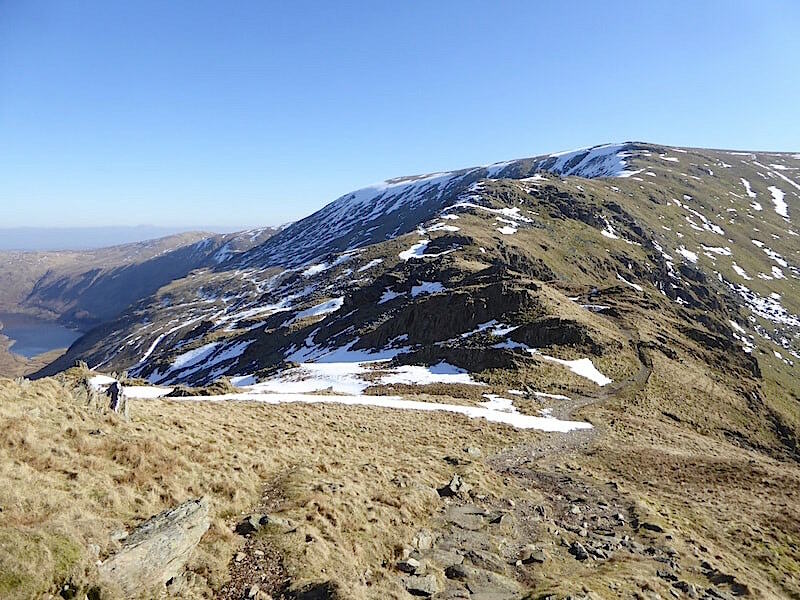 At last we reach the shade I’ve been looking forward to so a chance to lose a little heat as I take a look back at the steep slopes of Dudderwick and, on the skyline to the left of the wall, the knobbly ridge leading across Rough Crag. 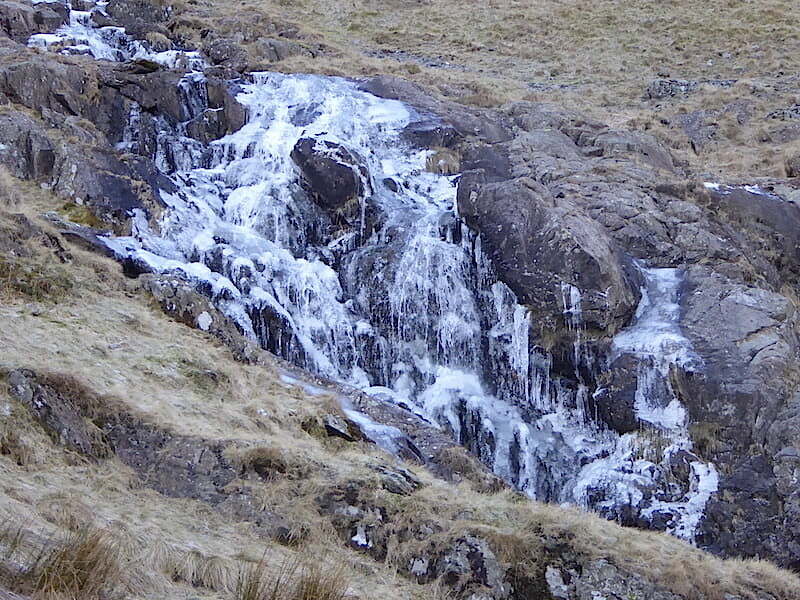 We continue to climb alongside Small Water Beck where the falls are frozen in time and where the normally thunderous roar has been subdued into a gurgling trickle as the water beneath searches for a descent route beneath the solid ice. This is the most frozen state we have ever seen these falls in, all we have seen in previous winters were a few icicles hanging from the surrounding rocks while the water continued to flow normally. How cold it must have been up here last night doesn’t bear thinking about. We arrive at Small Water after a good deal of foot stamping and pole prodding. No, we weren’t arguing or falling out, the route was so thickly and extensively iced over and the grass so slippery we made sure that spikes and poles were dug well in before trusting our footholds. 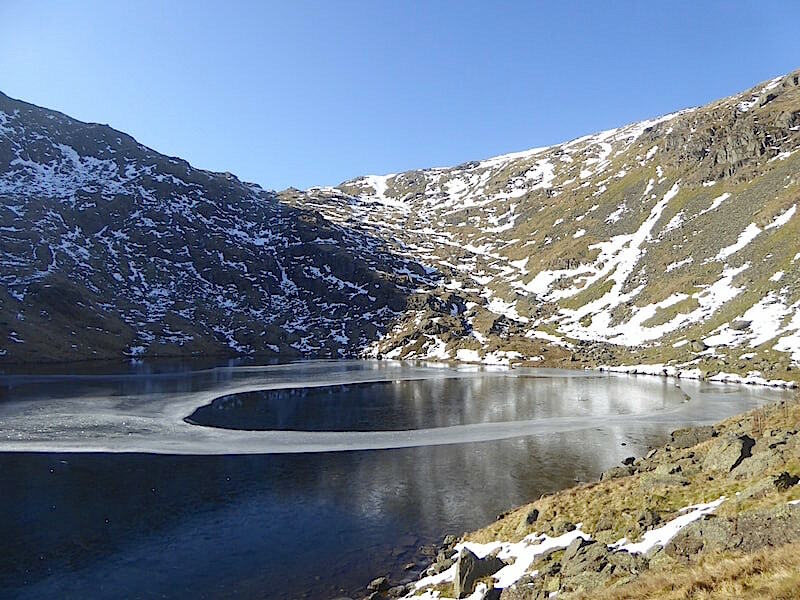 Small Water had a good layer of surface ice and provided some fascinating ice patterns as you will see shortly. 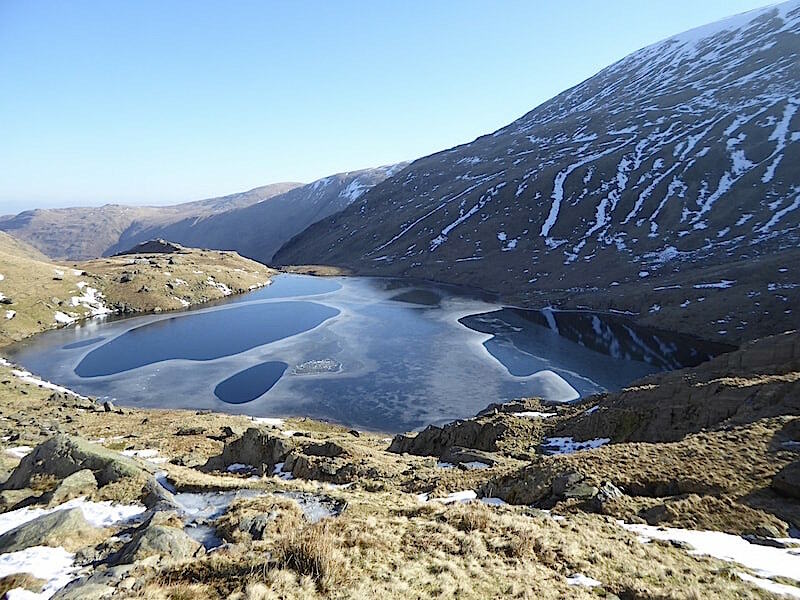 We step lightly and carefully across the black ice layering the stepping stones across the outflow and make our way over to the Nan Bield Pass route. We could have jumped across the outflow at one of the narrow points back along the beck but decided to live dangerously for a couple of seconds instead. 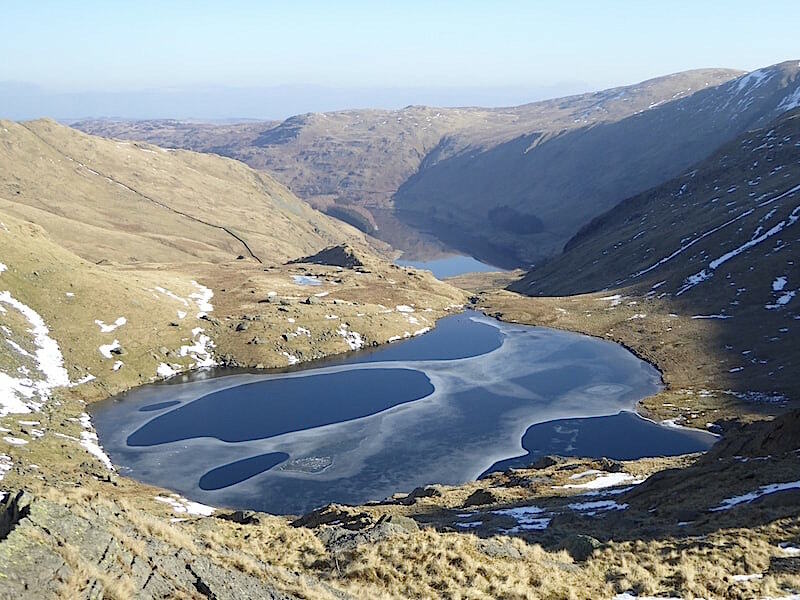 We track around Small Water with its pretty ice patterns and head over towards the Nan Bield Pass which runs diagonally from the tarn up to the V shape dip on the centre skyline. 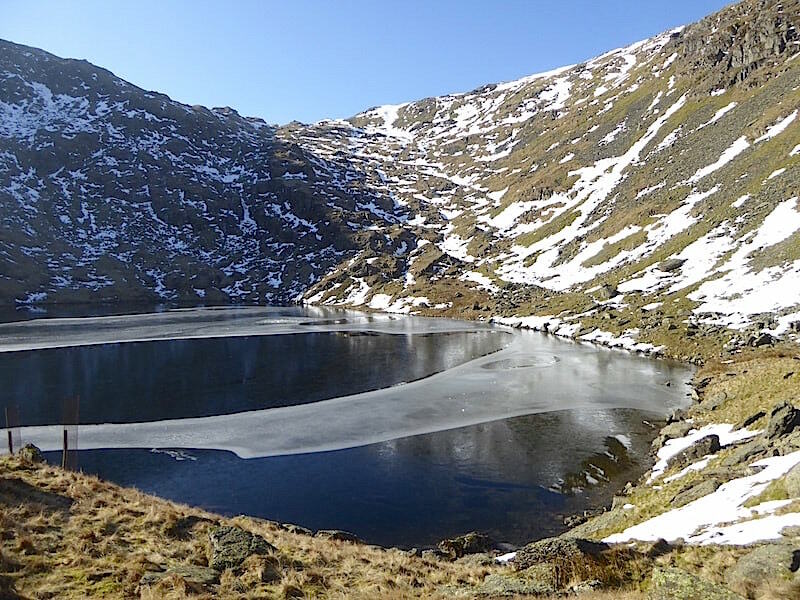 If ice patterns on tarns aren’t your thing you might want to skip the next few shots, I just happen to be fascinated by them so here are some more taken as we walked around and above it …..
….. the darker areas between the ice sheets are frozen too as a couple of stones thrown onto them confirmed. 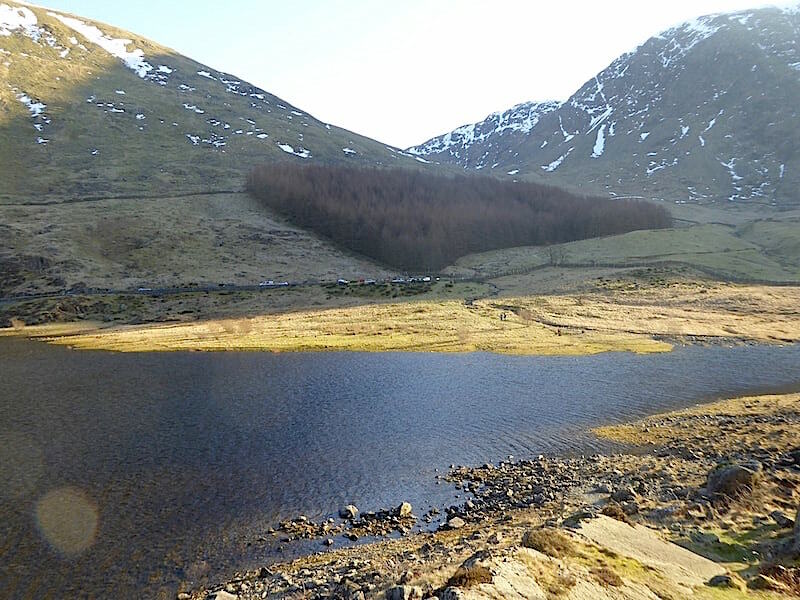 Another look back at Small Water as the path turns away from it and begins to rise to the small col between Harter Fell and Mardale Ill Bell. While he’s waiting J decides its now time to remove his jacket. 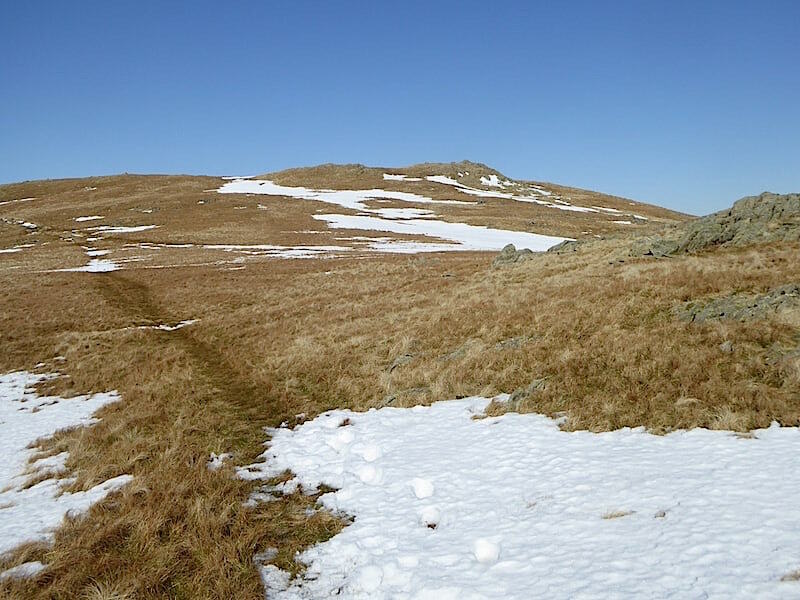 The snow on the path had turned into a ribbon of hard, compacted ice and even with spikes was hard work to negotiate so where possible we used the grassy areas. 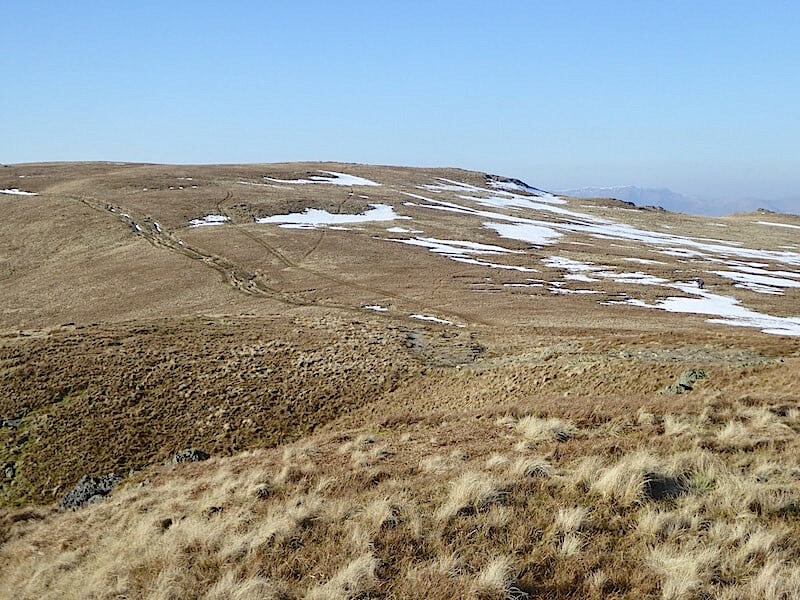 The path eventually disappeared beneath a wide and long expanse of compacted snow …..
….. and by keeping to the grass and skirting around the numerous outcrops we gradually wandered slightly away from it. Not that it mattered in the slightest as it gave us a different angle from which to take in the view behind us. 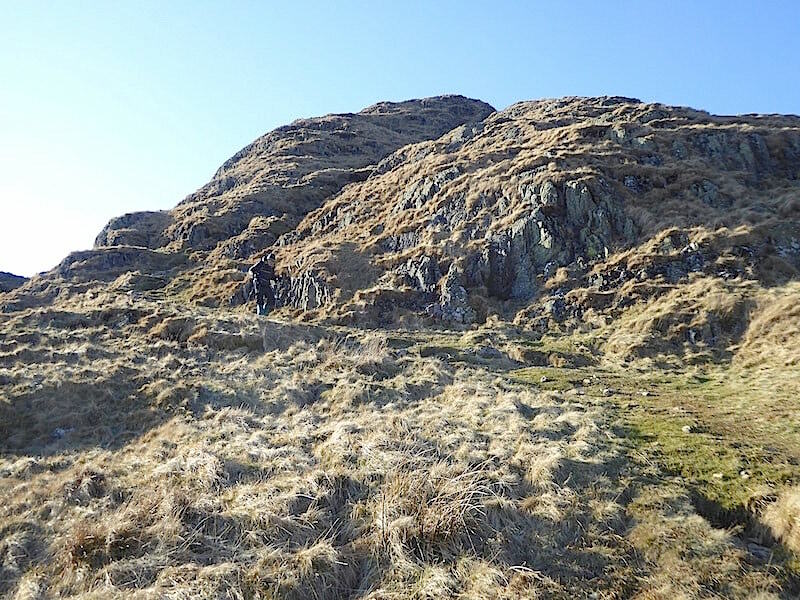 The climb is now much steeper and is made a little more difficult as the sun is directly ahead of us and we are having difficulty seeing where we are going and what lies ahead of us. A short stop for a breather here and for the gps to be checked as it is misbehaving again. The chief technician is getting ever more frustrated with it and, as I learned later, came close to hoying the thing down into Small Water. After what seemed like an eternity of effort we reach the top of the pass. 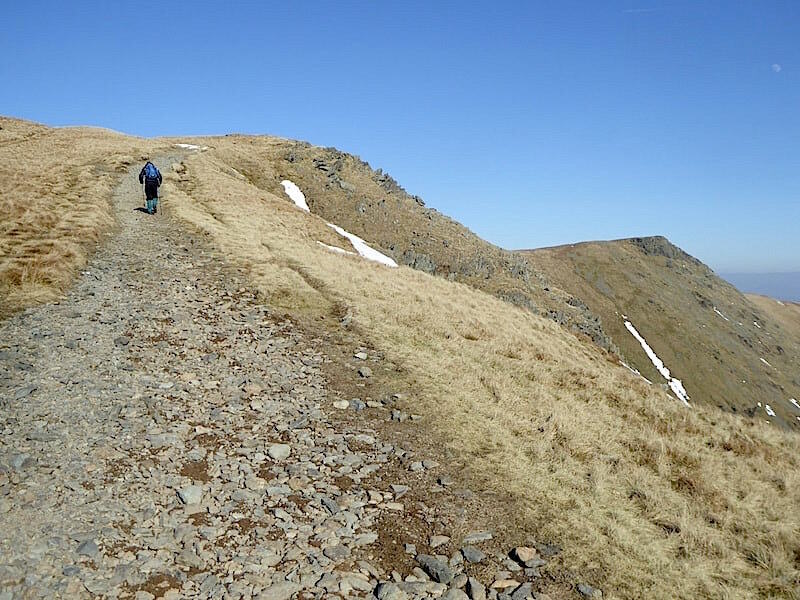 We had regained the path a little further back but instead of turning to the left and then up to the Nan Bield shelter we kept straight on and …..
….. came out a hundred yards or so to the west of it meeting up with the Mardale Ill Bell path. 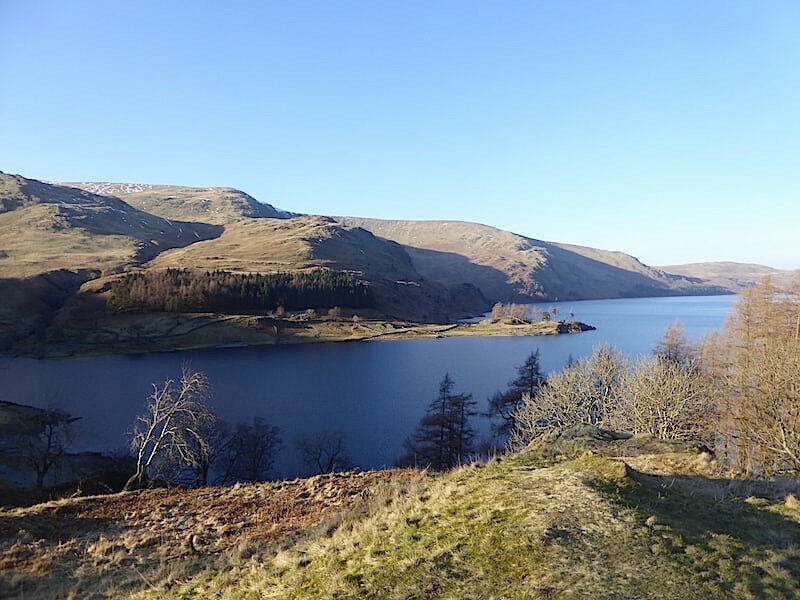 This was deemed to be a good place for a Mars Bar and coffee stop so we dropped down a few feet below the path, found ourselves a grassy perch and enjoyed the sunshine and the view for a few minutes. 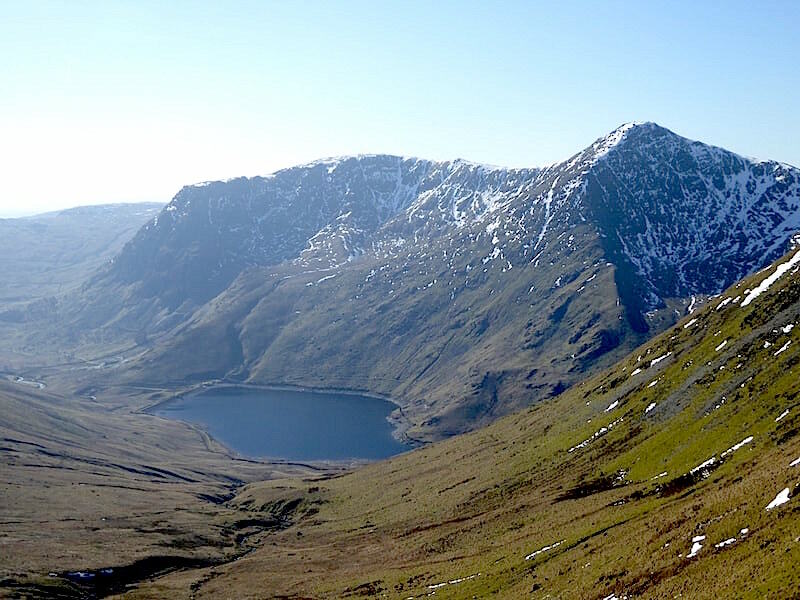 Below us Lingmell Gill flows into Kentmere Reservoir and rising above that is Ill Bell with Froswick to the right of it. 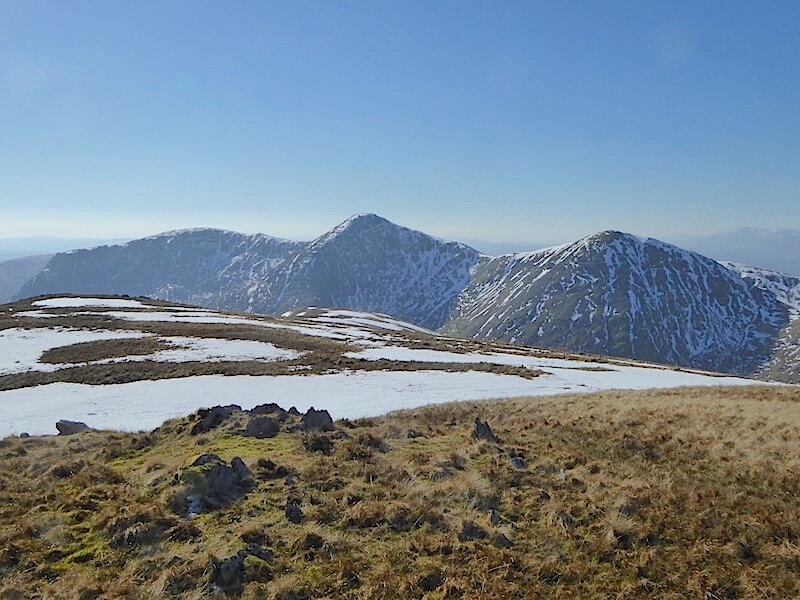 A closer look at Ill Bell and Froswick as we enjoy the sunshine, the still air and the coffee. Its not often you can linger here as the wind is usually blowing and being a nuisance so it was especially pleasant to just sit and soak it all up. Time to move on so we hoist the packs once more, follow the sheep trods back to the path on the right and begin to make our way over to Mardale Ill Bell. 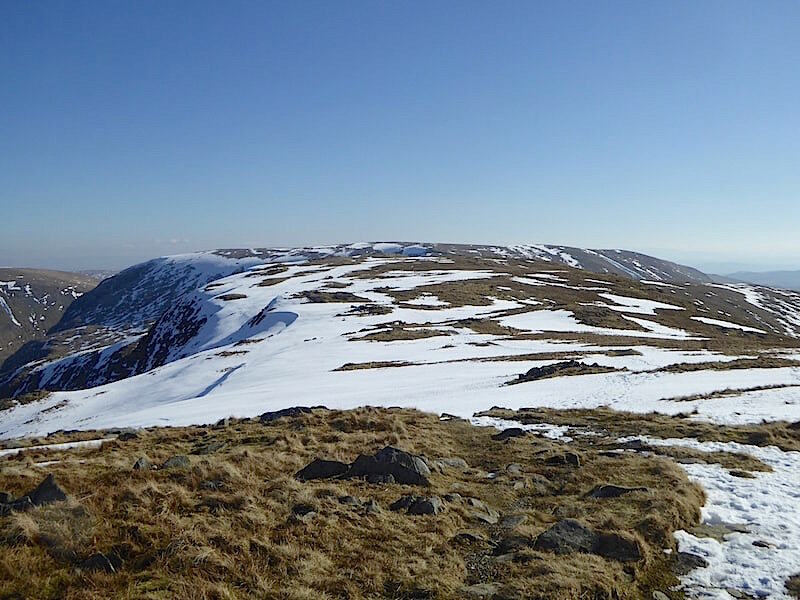 A look back at where the paths cross, we came in on the snowy one coming in from the left. 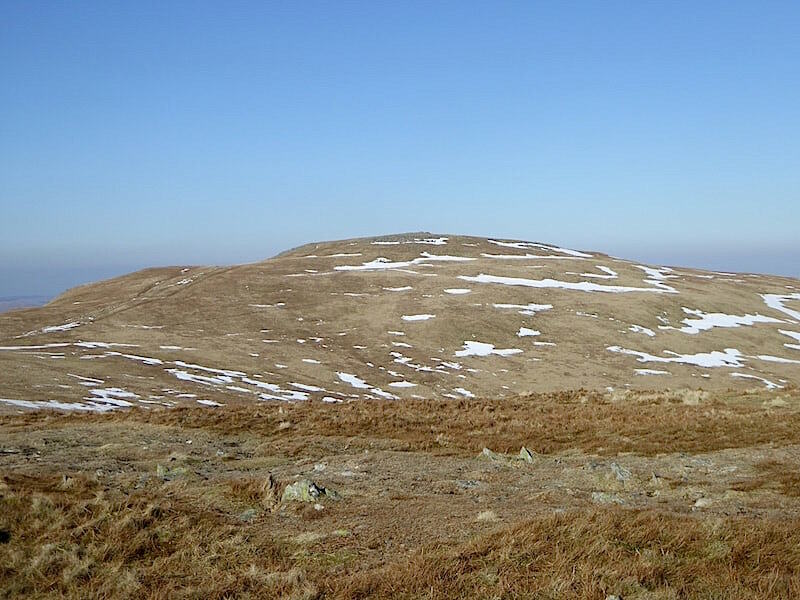 Had we continued left around the little hill just above it we would have arrived at the Nan Bield shelter. Below the little hill and the path beneath it is the grassy perch, with its superb view, we had settled on for our coffee stop. Only a few people passed above us walking in both directions while we were there. 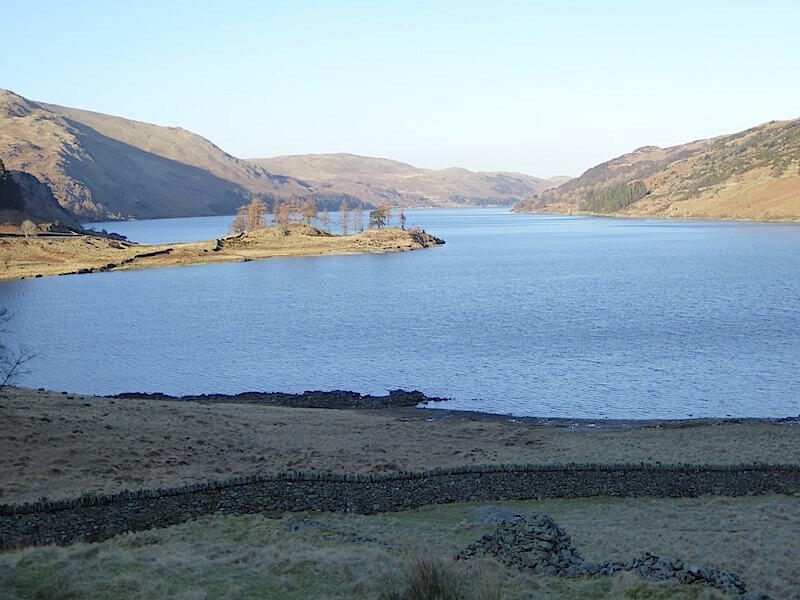 Its that view of Small Water and Haweswater again as we make our way up to Mardale Ill Bell. The dark swathe on the distant skyline is all we can see of the northern Pennines as its very hazy once again. 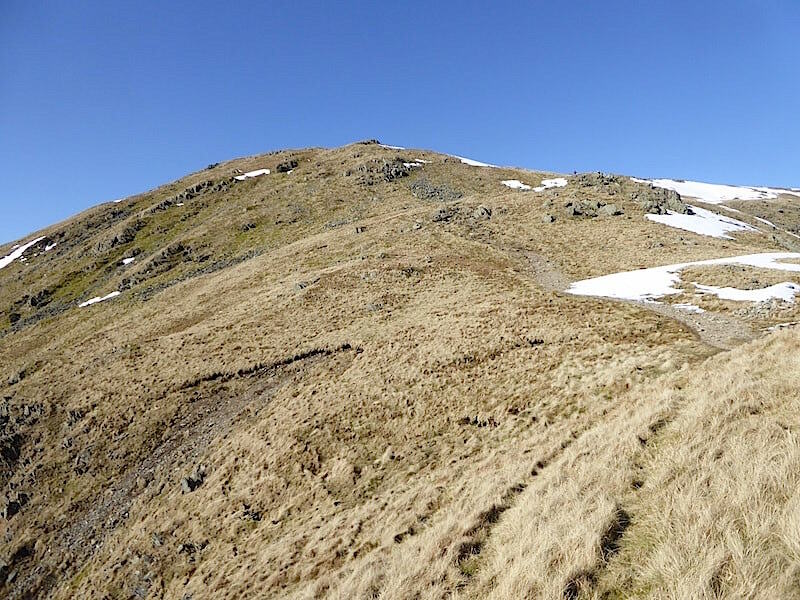 Rather than go straight across to Mardale Ill Bell we made a slight diversion and followed the path going across the top of Lingmell End where the view of Ill Bell and Froswick now has the added extra of Yoke on the extreme left. 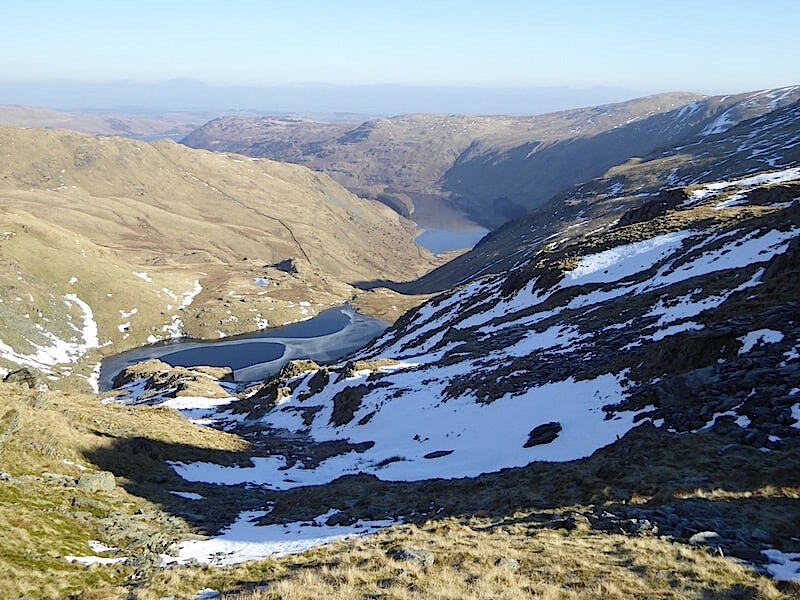 Mardale Ill Bell beckons over yonder but we stick to the path to get …..
….. this view, across Hall Cove, of Lingmell End, in the foreground to the left, and the infant River Kent making its way down the cove to the Kentmere Reservoir beyond. 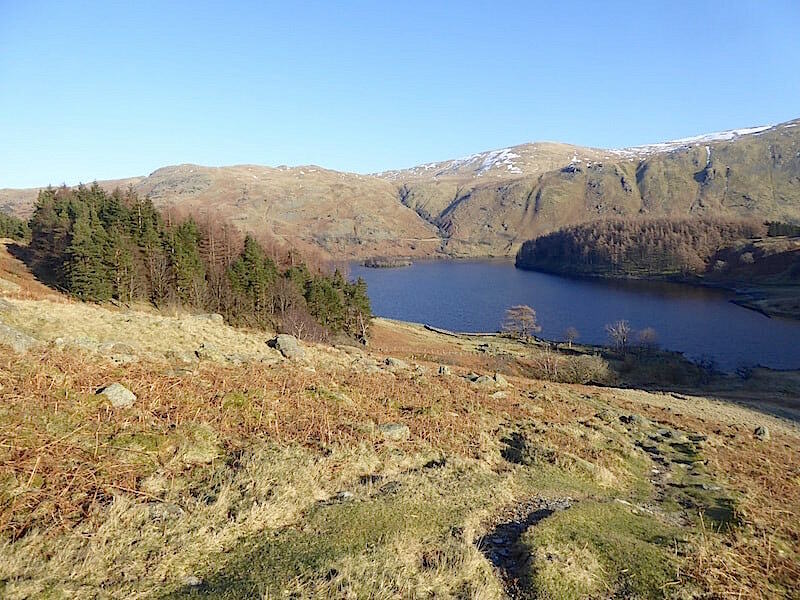 We follow the path a little further round and then cut across back to Mardale Ill Bell …..
….. where two walkers have just left and are making their way down to Nan Bield, while a family of four arrive and stay long enough for photos before heading off towards High Street. We are left in splendid isolation to enjoy the moment. 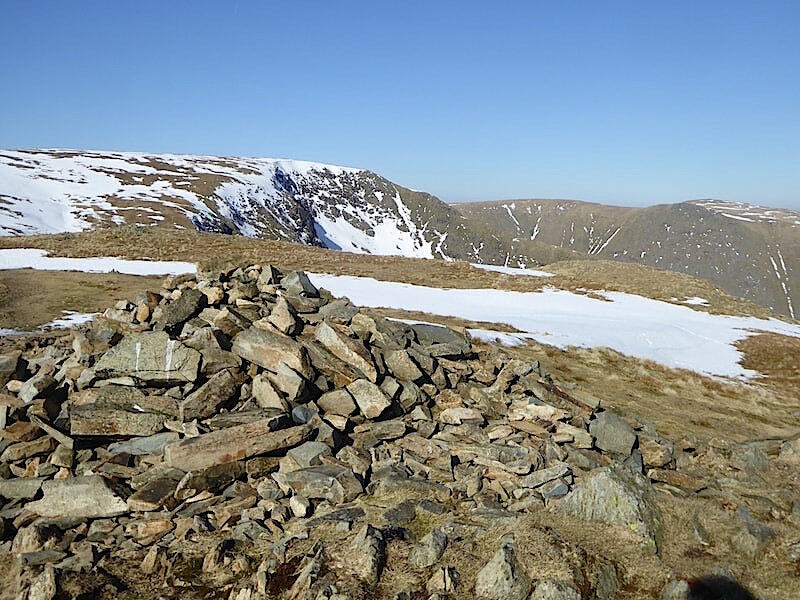 The summit cairn is no work of art and beyond it is a snowy High Street and to the right of that are Ramspgill Head, Kidsty Pike with High Raise just peeping out behind it. 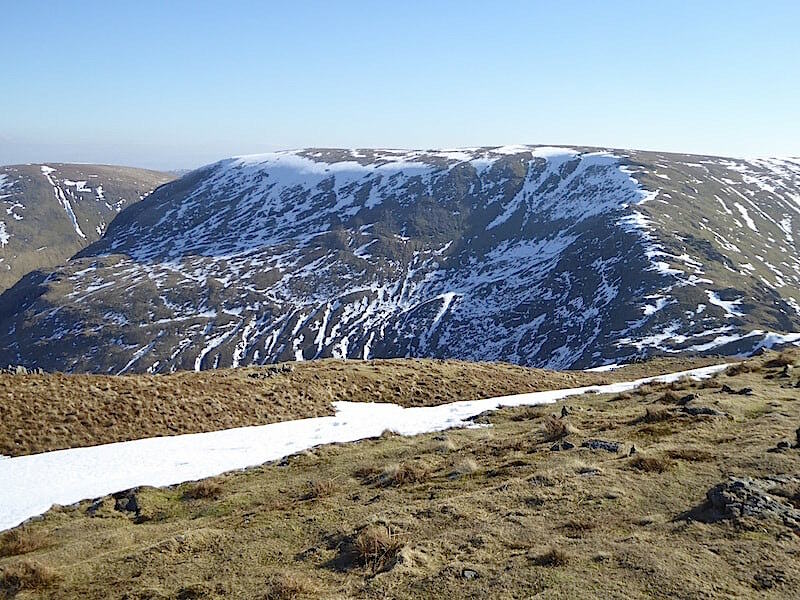 There is more of a cold breeze up here now but as we still have a longish walk over to High Street we leave the jackets off for the time being. 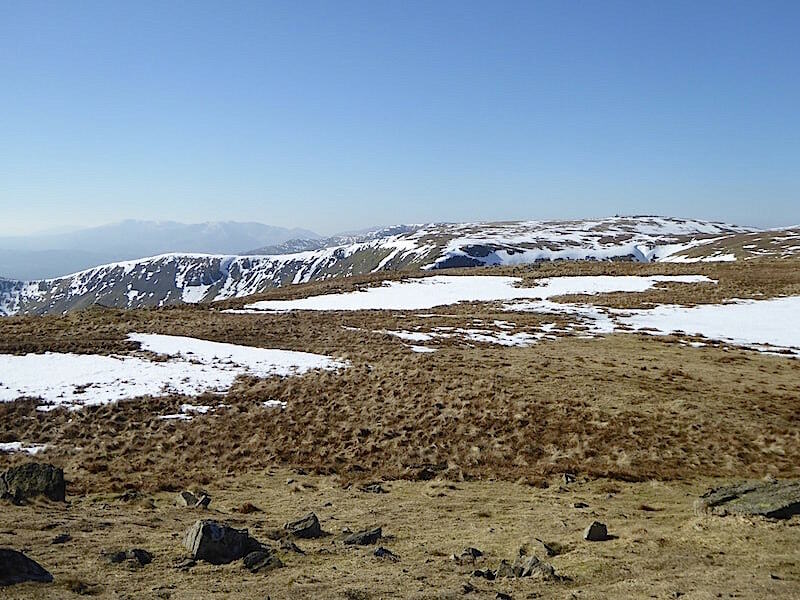 Hazy fells in the distance and although its clear enough up here its still not easy to pick out Thornthwaite Beacon atop the snowy rise over on the right. 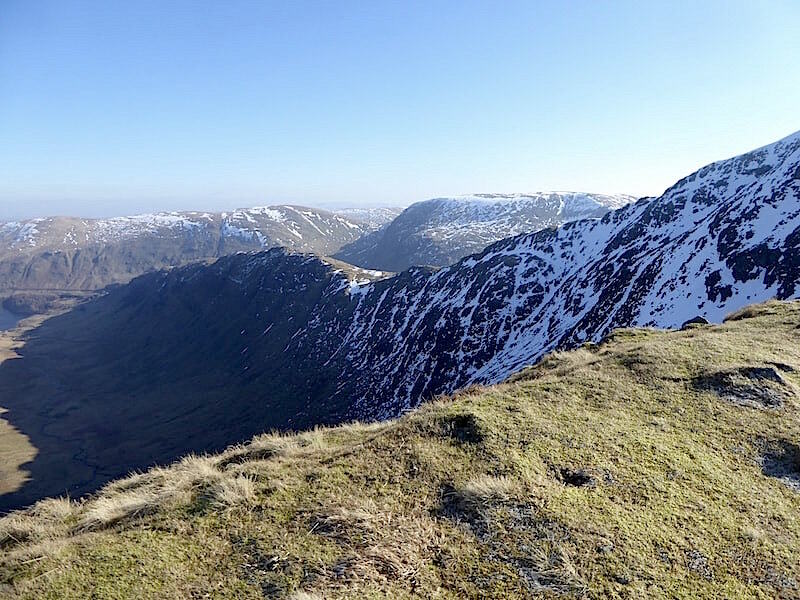 Behind me is the unmistakeable mass of Harter Fell…..
….. while over to my right we have a couple of glimpses of Haweswater. 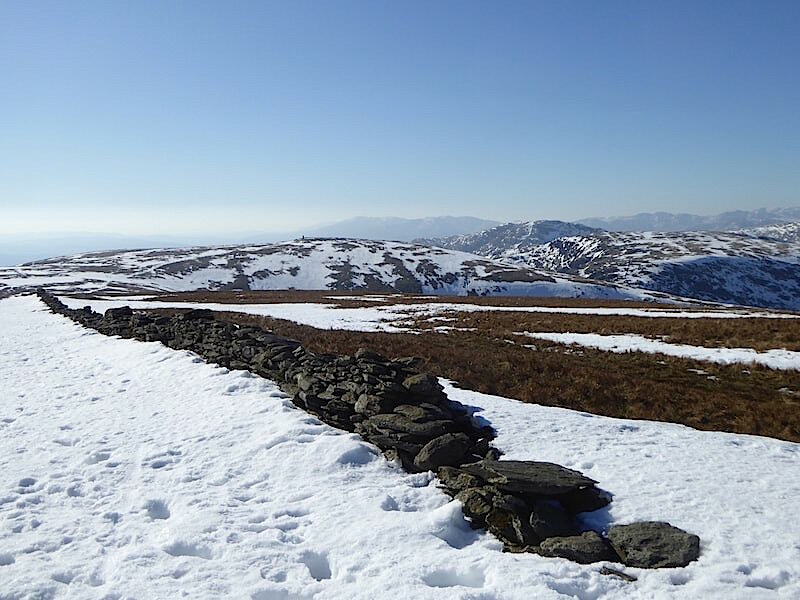 Off we go again, making our way over to High Street with a look back across a still very snowy Mardale Ill Bell. 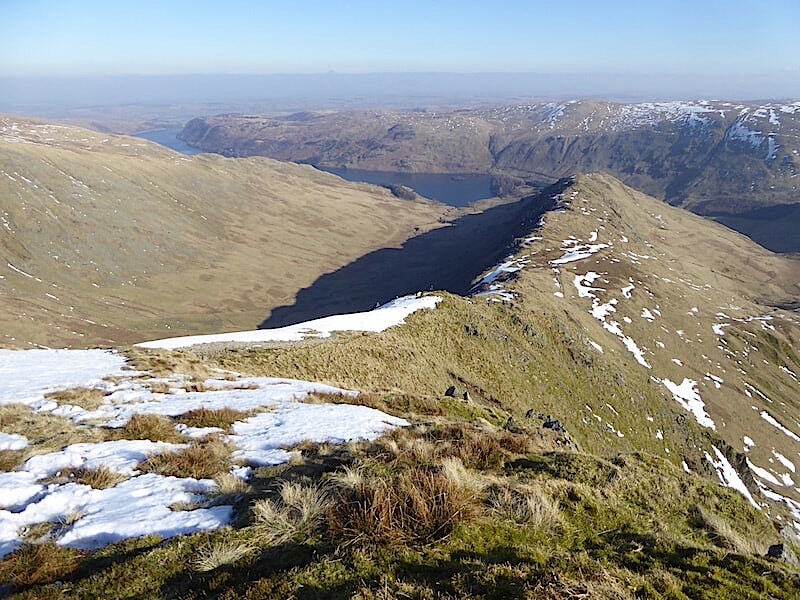 I did venture a little way toward the edge on the left hoping for a view of Blea Water but I didn’t like the look of the cornice so I backed off. 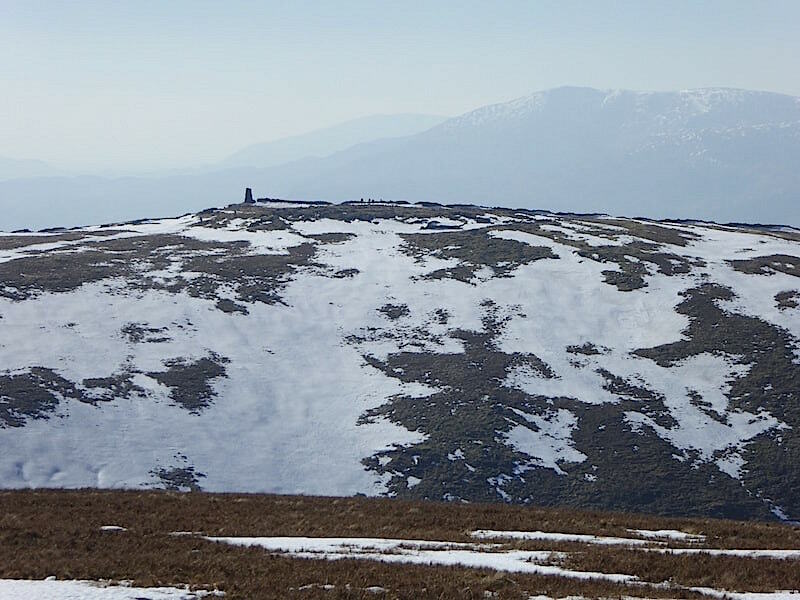 We reach the long, long wall across High Street which offers a slightly clearer view of Thornthwaite Beacon on the little rise just left of centre …..
….. with a close up view of it thrown in for good measure. Looks like it has a few visitors today. A very bitter wind was now hitting us from the east so the jackets went back on. A few views to the west of us as we walk across High Street. 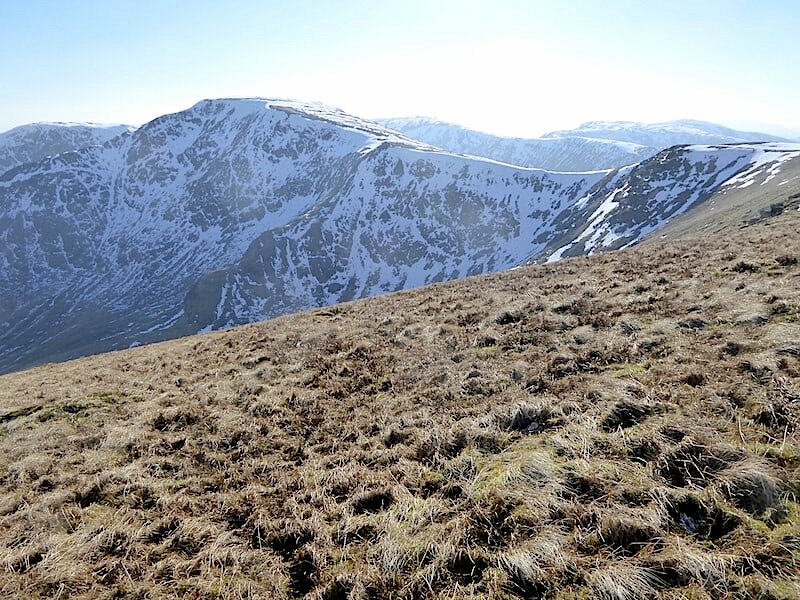 The ridge along the middle foreground is Thornthwaite Fell leading up to the Beacon, beyond that is Caudale Moor with Red Screes behind and to the left. 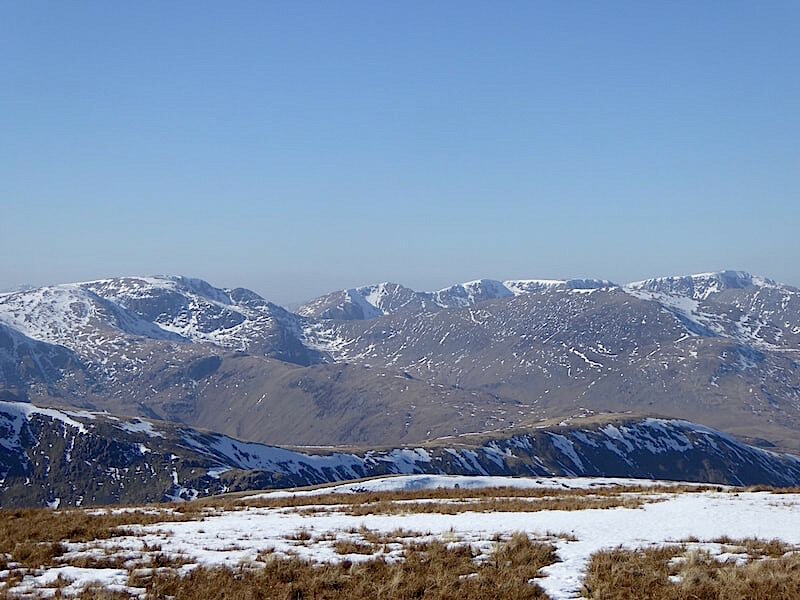 On the distant skyline to the right are Crinkle Crags and Bowfell …..
….. across the middle foreground, behind the Gray Crag ridge, is Dove Crag with Hart Crag to its right …..
….. Hart Crag on the left merges into Fairfield, to the right of which Saint Sunday Crag stretches across the middle foreground with the Helvellyn range on the skyline just behind it …..
….. and finally, Helvellyn now on the left, followed by Catstycam, White Side, Raise and Stybarrow Dodd, so lots of fell spotting can be indulged in over to the west of High Street …..
….. which is just as well since there isn’t very much to see over to the eastern side. 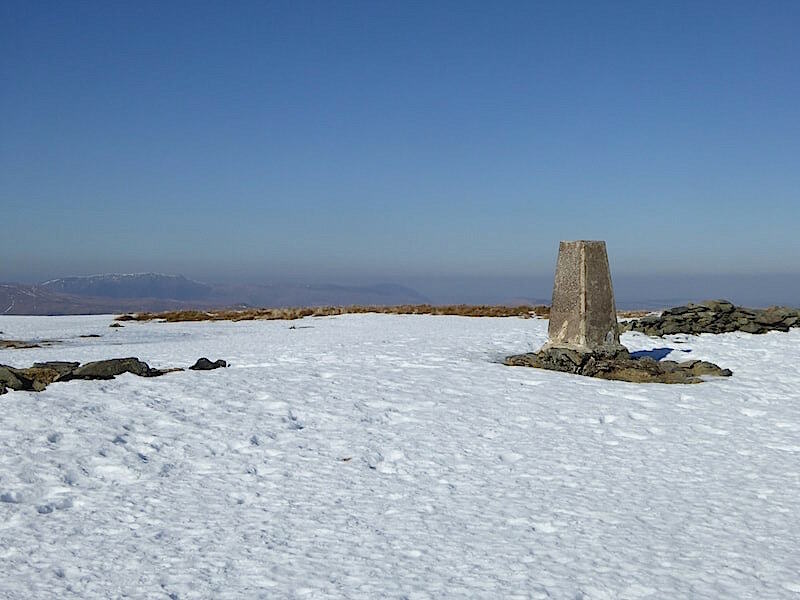 When we arrived at the trig column a young man was leaning against it and staring down at a mobile phone. We were astonished at his lack of warm clothing. He was dressed in thin, brightly coloured lycra leggings, the kind you see cyclists wearing, which ended just below his calf muscles. Over them he had on a pair of thin ‘fashion type’ shorts which ended above the knee. On his feet were a pair of trainer socks, those which end just below the ankle, and a pair of what I can only describe as ‘street style’ trainers, definitely not running shoes and nowhere near sturdy enough or grippy enough for the ground conditions today. Between the ankles and the calves the bare legs were blue with cold. I can only assume he was wearing some sort of sweater/jumper beneath his jacket. No hood, no hat, no gloves. The back pack was a thin cotton drawstring affair, with nothing very much in it from the look of it, with just two thin cords holding it over the shoulders, just the kind of bag you see teenagers toting on their way to school. As if the clothing wasn’t a big enough surprise, as we approached he asked us “Is this Hayeswater Gill?” Keeping our astonishment firmly under control we replied “No, this is the trig point on High Street.” Another study of the mobile phone for a moment or two and then “Do you know where Mardale Ill Bell is?” We pointed him in the right direction which just happened to be straight into the teeth of the bitterly cold wind, and after thanking us he gingerly started walking across the icy and unyielding snow towards it. 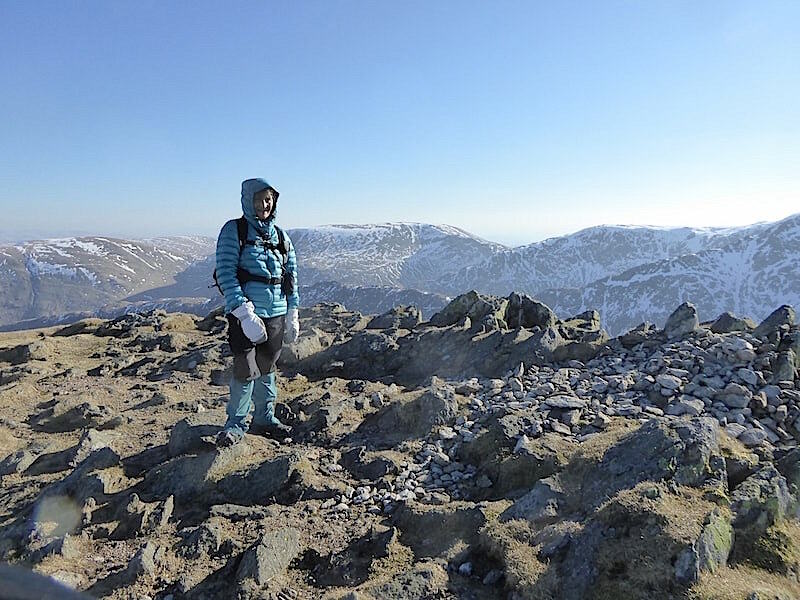 Definitely not a fell runner despite the lightweight clothing, fell runners know their routes. 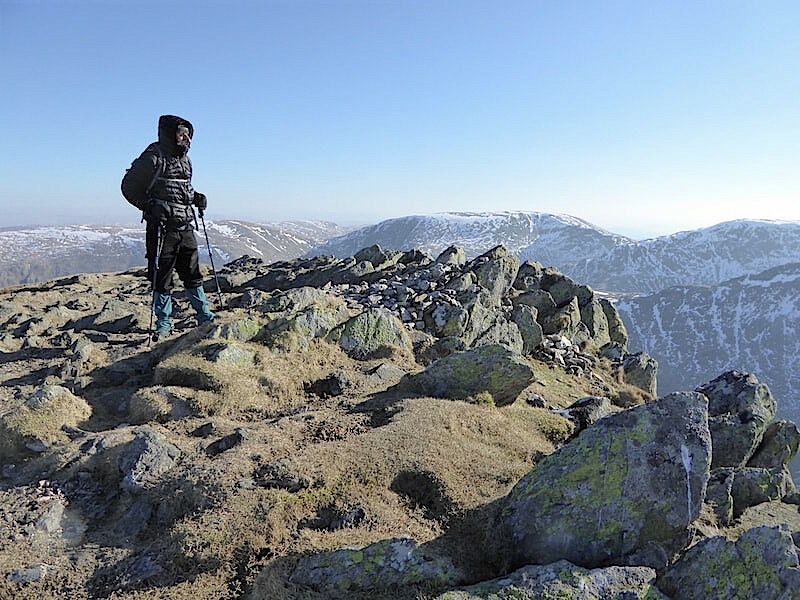 Simply a walker, lightly clad and shod, not aware of what a gill is, no clear idea of his location and relying solely on a map on a mobile phone which he seemed to be struggling to interpret. What happens if the phone battery dies? 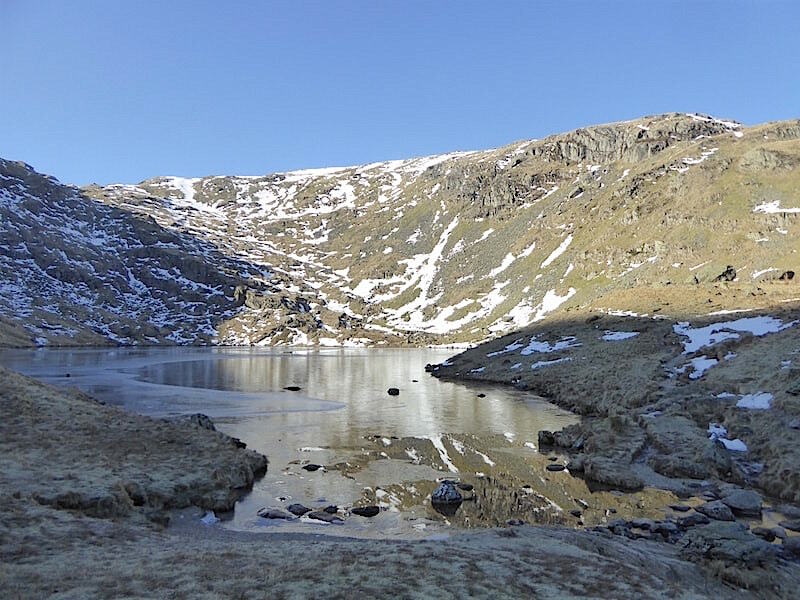 I hope he got off the fells safely and, much as I try not to reach possibly ill-informed conclusions, I can well understand the frustration and irritation expressed by the MRTs when they meet with similar lost souls. 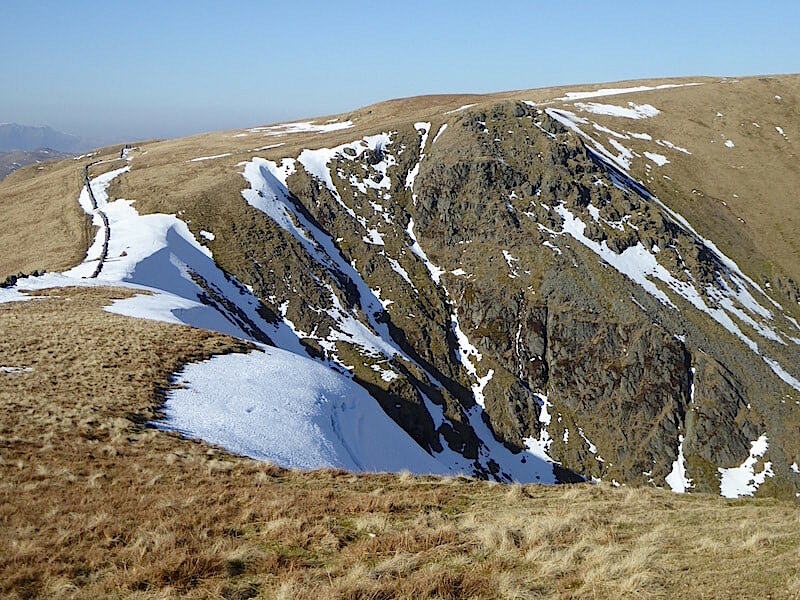 Still not quite able to believe or understand what we had just experienced we walked over to the point at which the Long Stile/Rough Crag ridge rises up to meet the High Street plateau. The wind is coming in from the right of the shot and although it isn’t strong enough to blow us over the wind chill is extreme. Under my thick mittens I’m wearing fleecy gloves and I’ve cut off the finger ends of the right hand glove so I can operate the camera without having my whole hand gloveless and exposed to the cold. In normal wind temperatures it would probably have worked fine but not today, and within seconds of removing the mitt my whole hand was numb. Just a slight turn to my right provided this shot of Blea Water down below us. How this turned out so well is beyond my understanding, my eyes and nose were indulging in a spot of synchronised watering and the whole thing was just a blur as far as I could make out through the viewfinder. Well, at least I finally got my shot of Blea Water. 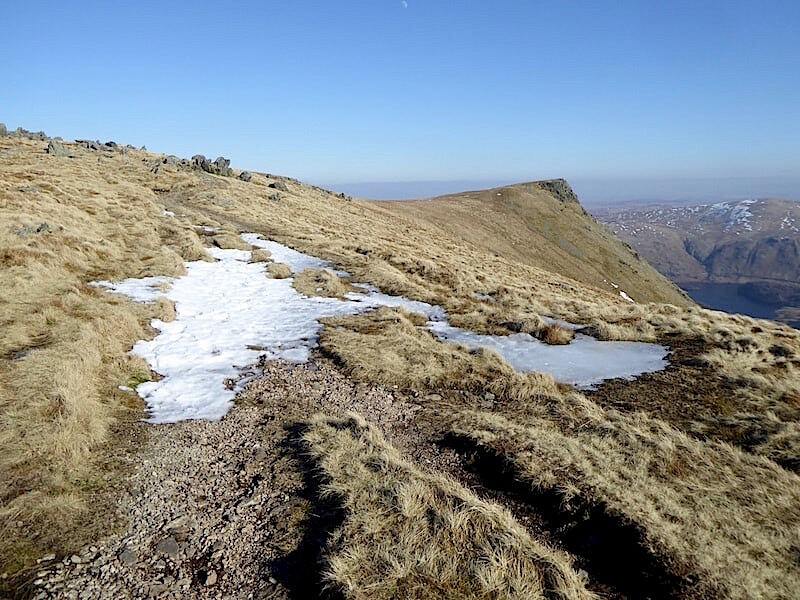 We return to the High Street path and continue on down the compacted snow trail with hoods pulled tight over our heads, while any skin remaining exposed to the wind became increasingly immobilised as we descended. I resorted to blowing into my gloves to get some feeling back into them but it was a slow process. 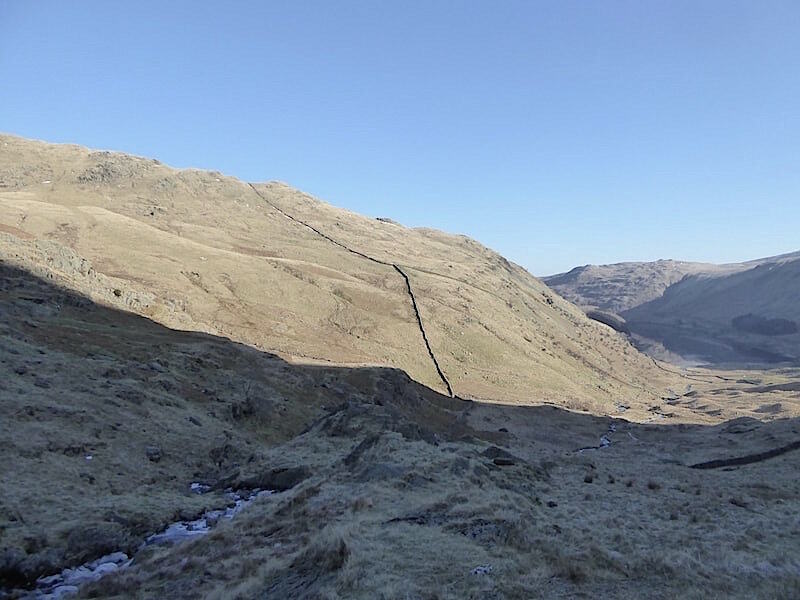 We make our way down towards the wall over Short Stile hoping to find a decent section of wall behind which to shelter and get out the sandwiches and hot soup, especially as the coffee break now feels as if it was light years ago. 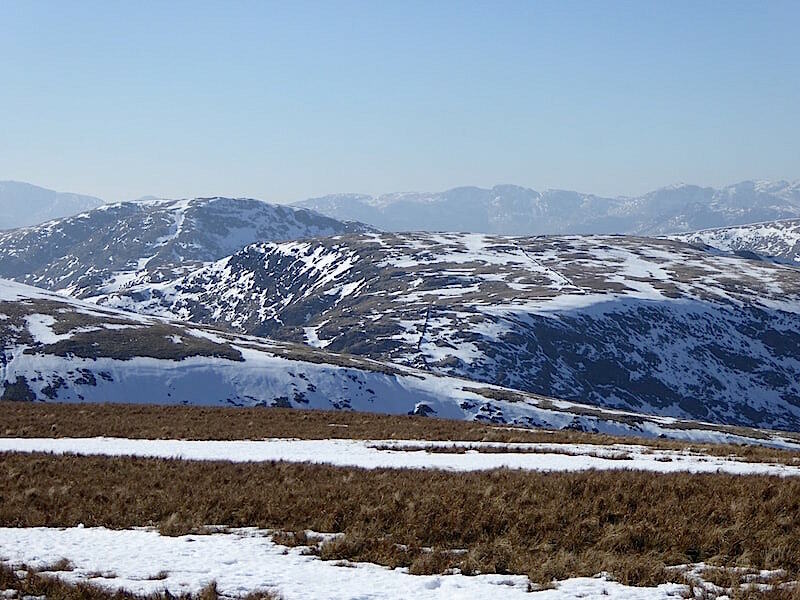 The pointed top of Kidsty Pike is over to the right of the skyline and you can just see High Raise peeping up behind the ridge line. 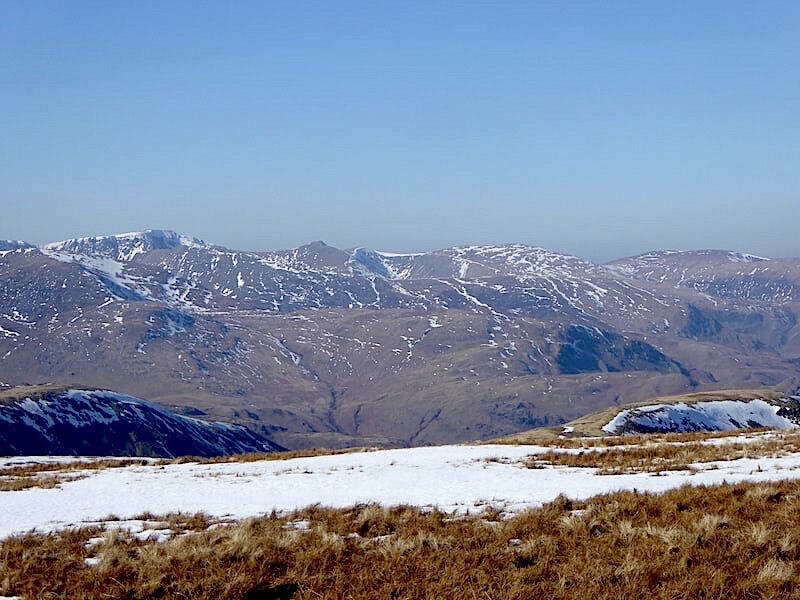 A couple of walkers heading towards the Straits of Riggindale with Twopenny Crag rising to the right of them. 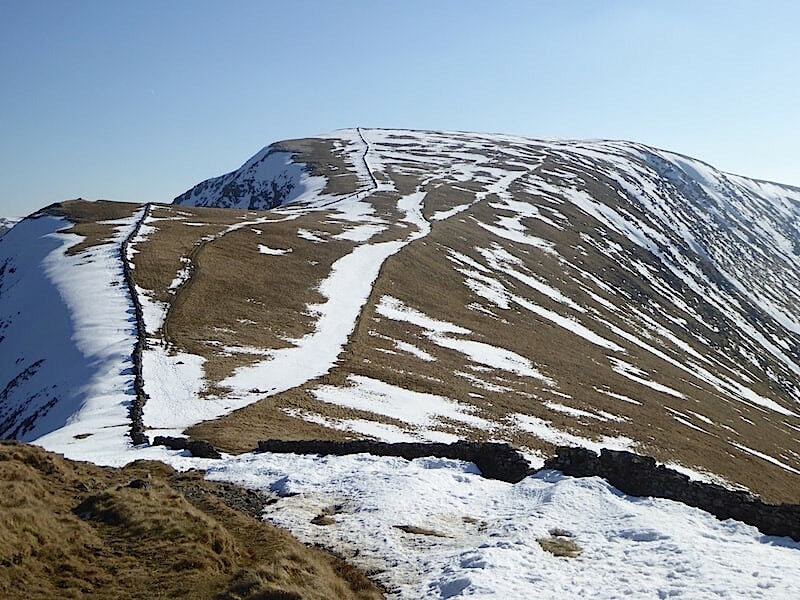 We’re still heading for Short Stile and the windchill is still finding its way into every little nook and cranny of our clothing. 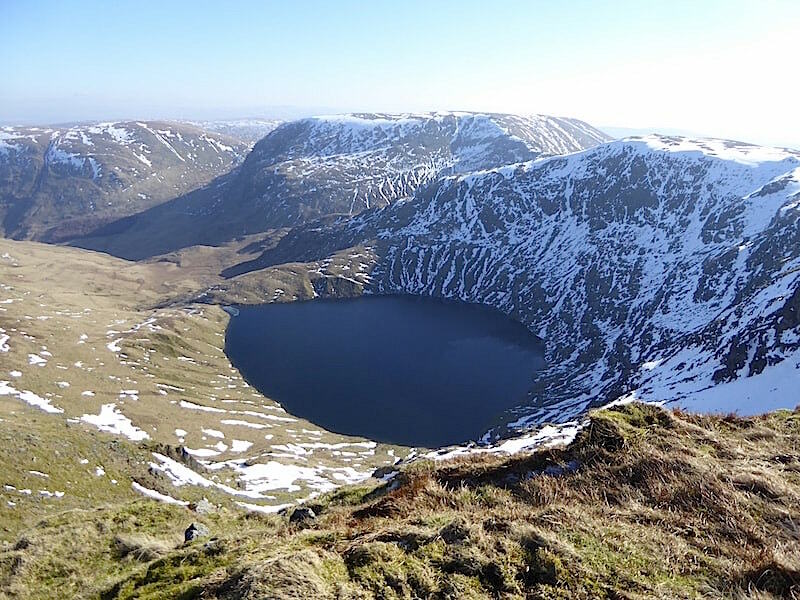 I can’t help but think of ‘the lost soul’ and whether he’s made it to Mardale Ill Bell yet. 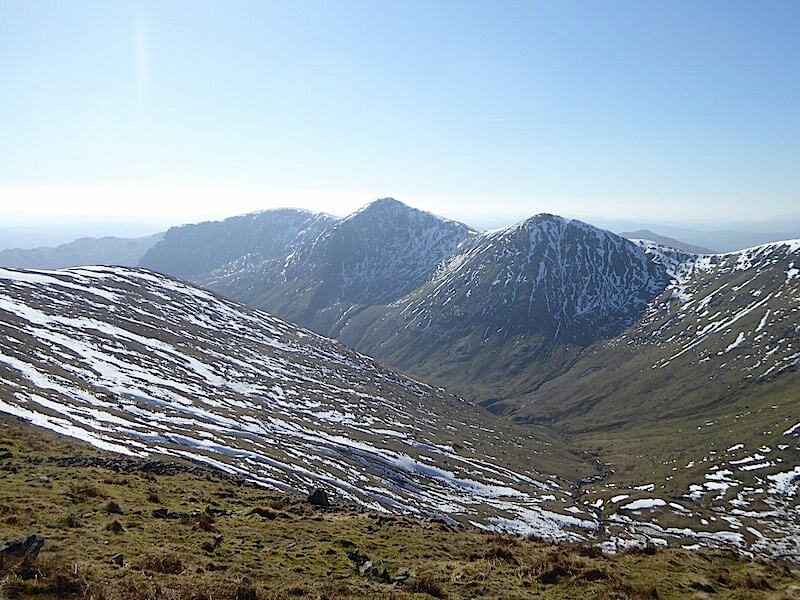 Over on our left, across Gray Crag, we have a reasonably haze free view of Deepdale Hause, the U shaped gap between Fairfield and Saint Sunday Crag. On Short Stile to take a look back at High Street where the absence of any considerable numbers of walkers surprises us. I would have thought this fine weather would have had people coming out in droves. 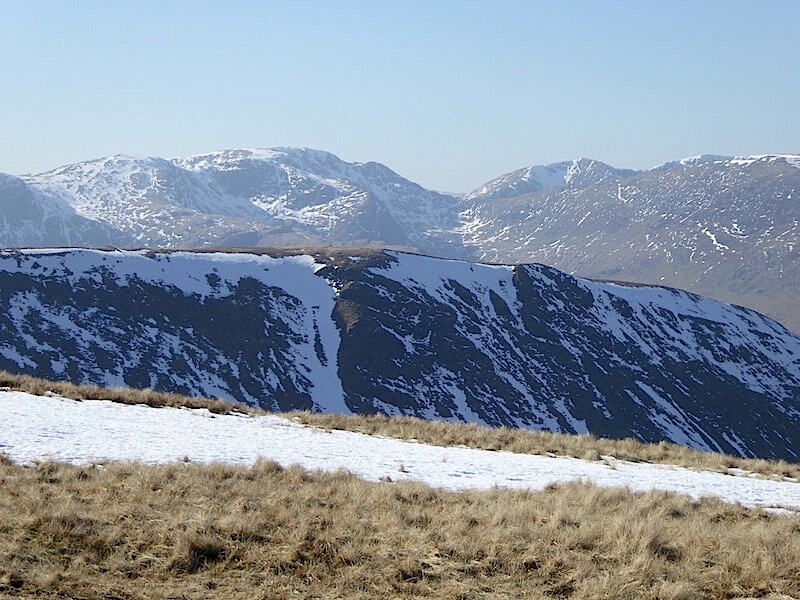 The Long Stile/Rough Crag ridge from Short Stile. OK, its time to put the camera away and find a suitable place for our refuelling stop. Just time for a quick shot of Twopenny Crag though before returning to the wall over towards the left to see if we can find a bit of shelter. 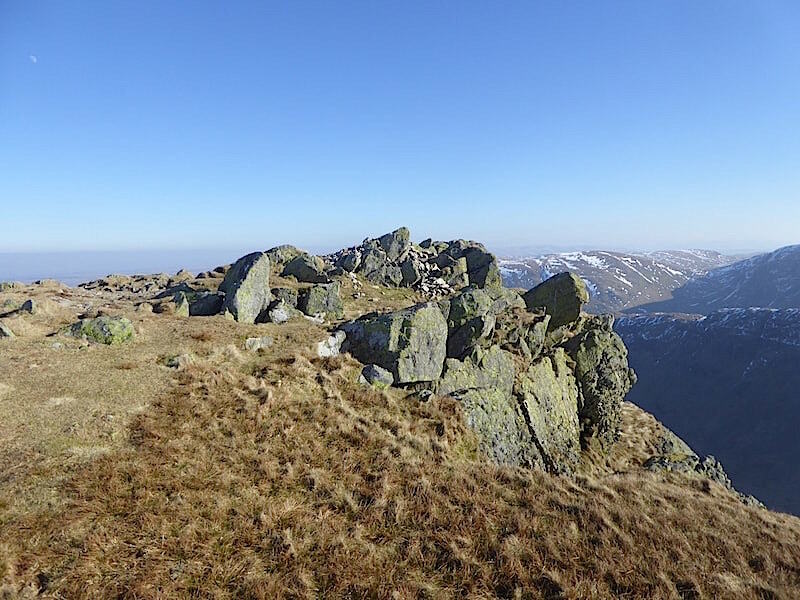 Over on the left is Short Stile with a wall running across it just to the right of the little cairn. 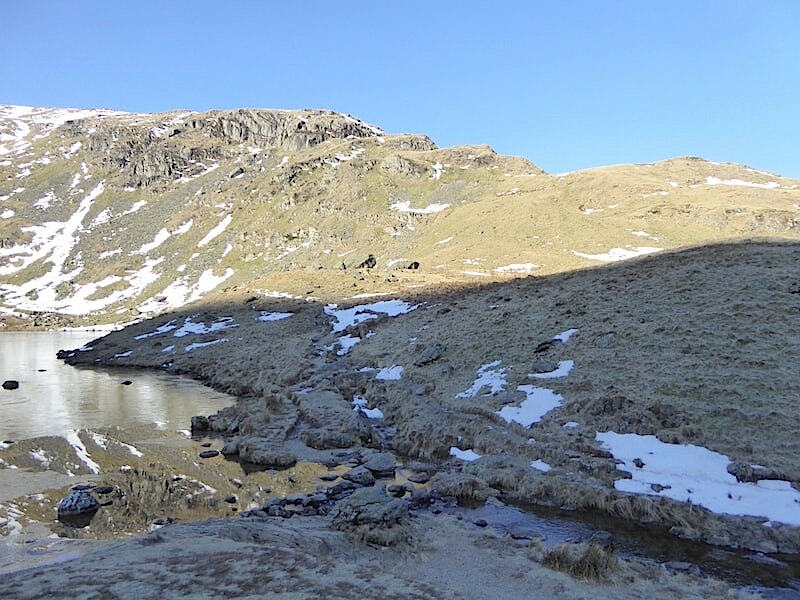 We found a snow free sunny spot, nicely sheltered from the wind by High Street, just below where the wall reaches the crest of the rise, and never have hot tomato soup and ham sandwiches tasted better or been more welcome. 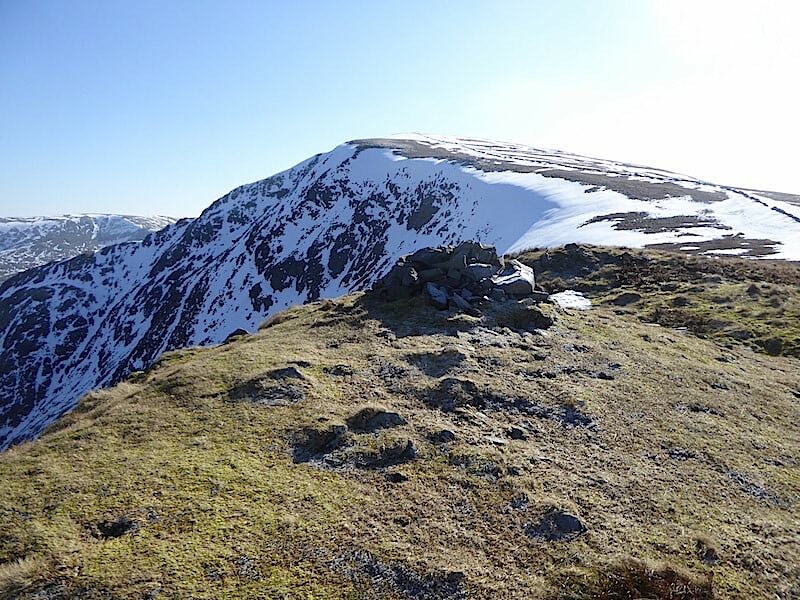 After refuelling we hoisted our packs once again, crossed the Straits of Riggindale and began making our way up towards …..
….. Twopenny Crag and Kidsty Pike. Of course, having turned eastwards and no longer sheltered by High Street we are now feeling the wind and its accompanying chilliness coming at us once again so I resort to shielding the right side of my face by pulling my hood fully across it. I could have done with another pair of hands across here if only to deal with the eye wiping and the nose blowing side of things because my existing two were busy keeping the hood over my face and carrying my walking poles. 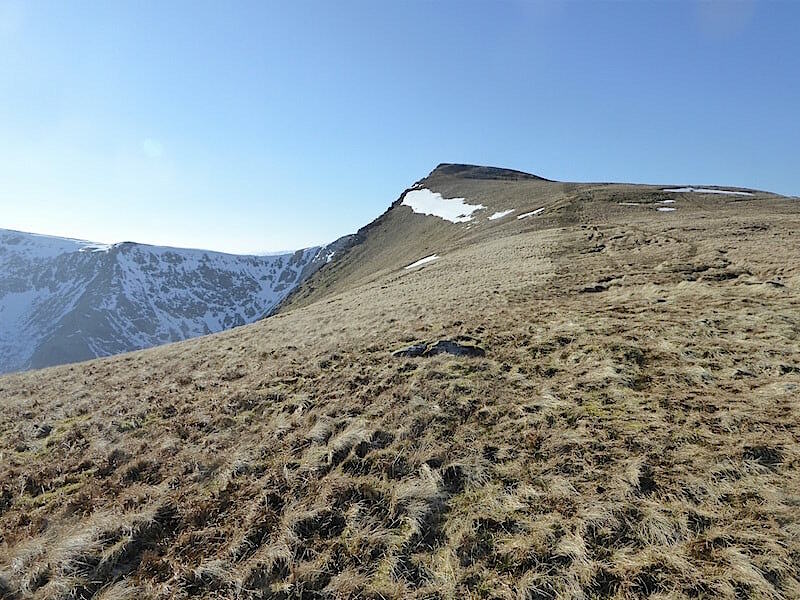 Beyond Twopenny Crag now and the always enjoyable tramp across the rock hard ground over to Kidsty Pike, where there wasn’t a hint of squelchiness anywhere. 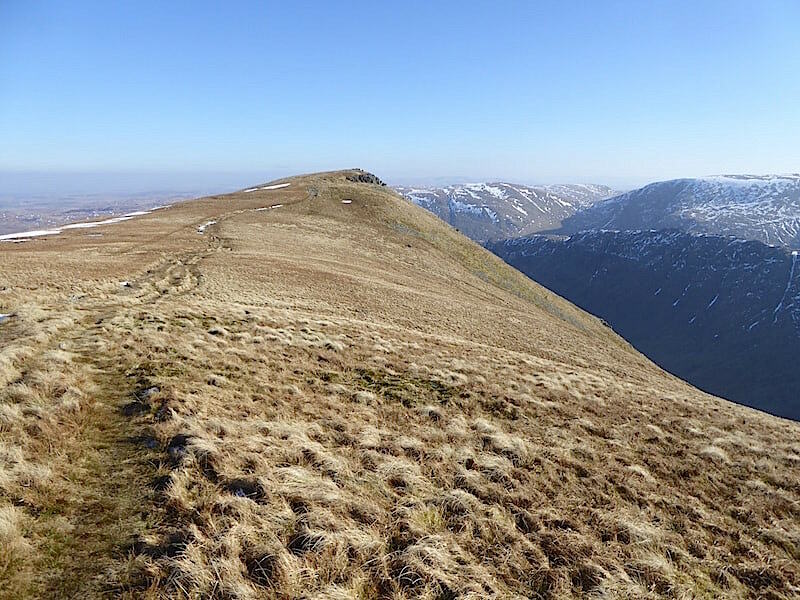 A look back at High Street, Short Stile and Twopenny Crag as we stride out over the open ridge …..
….. and make our way over to the summit of Kidsty Pike …..
….. from where we have a view of High Raise across the open moorland behind us …..
….. and, looking back the way we came, over towards Rampsgill Head with the hazy outline of Blencathra in the distance to the right of it. 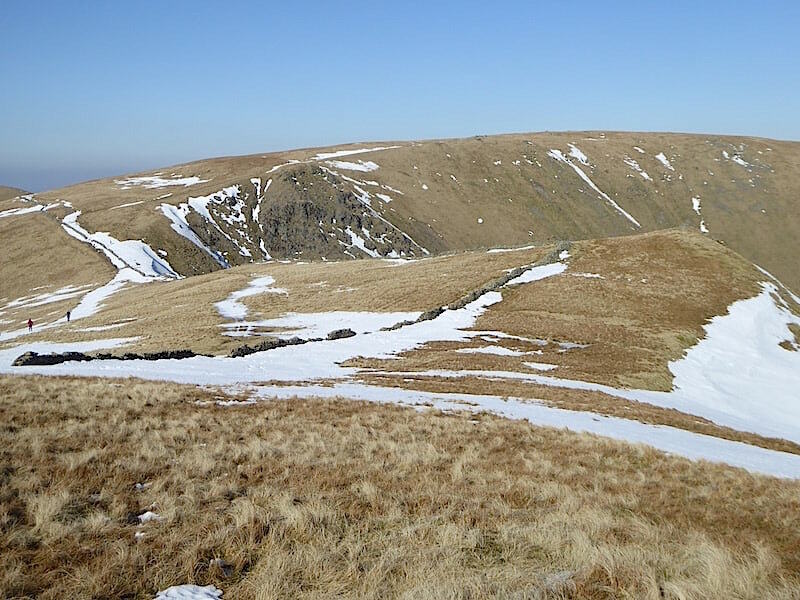 Across Riggindale are High Street, Short Stile and Twopenny Crag …..
….. from the bitterly cold summit of Kidsty Pike, where our face muscles are now so numbed by the windchill we’re finding it difficult to speak …..
….. and where it is much too cold to hang around any longer …..
….. so we turn tail and head down to the warmer and less windy climes of Haweswater and Mardale. 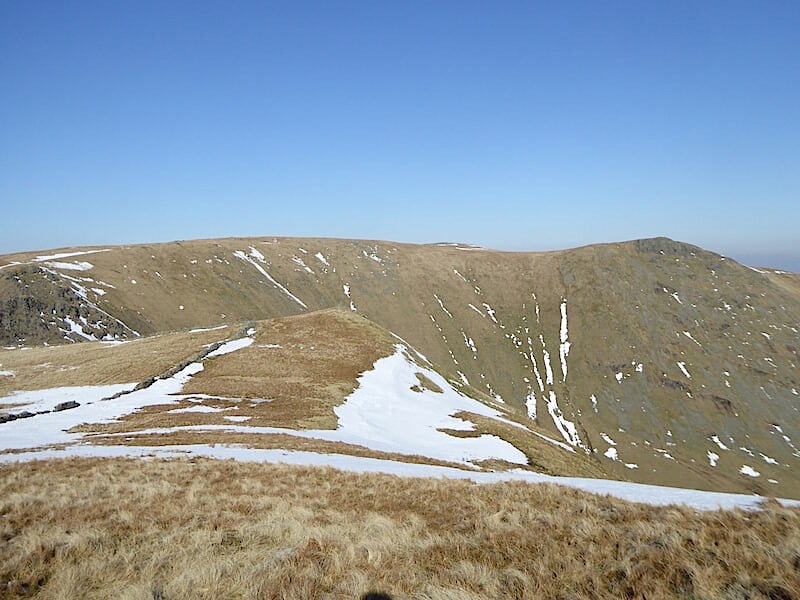 This is another very enjoyable tramp and surprisingly quick descent, I took this look back after only five minutes or so after leaving the summit, but …..
….. we are rapidly approaching Kidsty Howes whose humps and bumps and twists and turns will inevitably slow us down, unless we choose to go round to the left and follow a grassy route closer to Randale Beck, we’ll decide when the time comes. 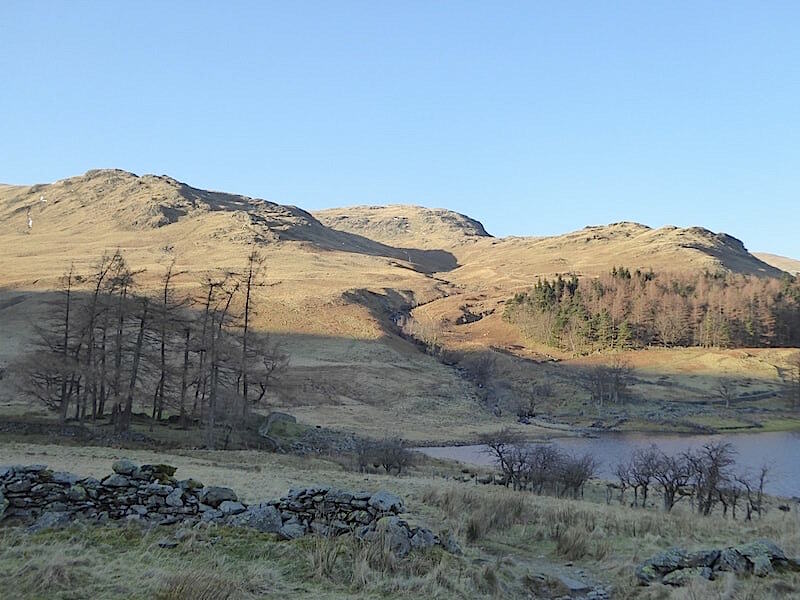 On the skyline above Kidsty Howes we have a sunlit view of Selside Pike, Artle Crag and Branstree which makes for a pleasant change. You’ve probably noticed by now that we didn’t move over to take a less rocky route on the Randale Beck side of Kidsty Howes so we had an entertaining little scramble instead. Back on terra firma and a look back at the Kidsty Howes obstacle course. 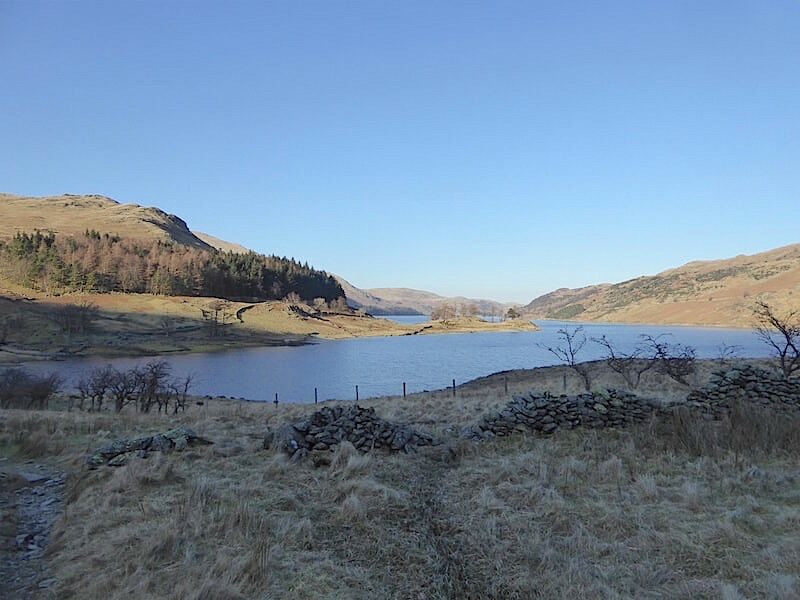 No more obstacles to deal with now and its downhill all the way to Haweswater in the lovely afternoon sunshine, but best of all is the complete absence of that bitter wind down here. 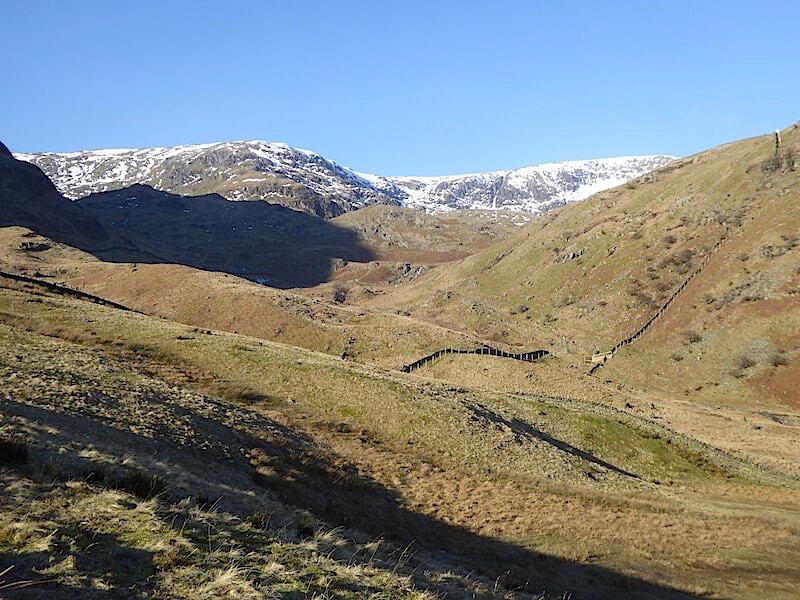 It wasn’t too chilly even when we were in the shadow of Rough Crag and Long Stile as we crossed Bowderthwaite Bridge spanning Riggindale Beck. 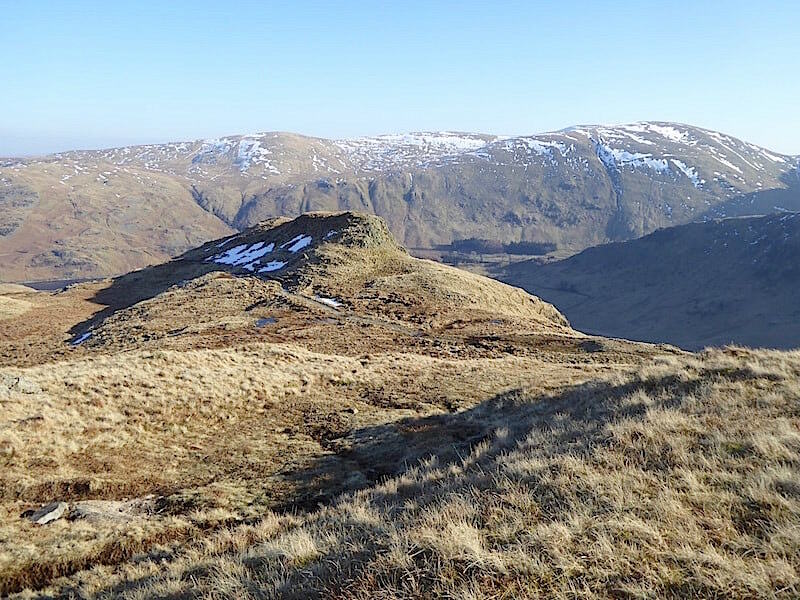 As we crossed the last little beck and made our way up to The Rigg I took a last look back at Kidsty Pike and Kidsty Howes still in full sun, and recalled those short December days when the sun would have dipped behind High Street by now and this view would be draped in its shadow. 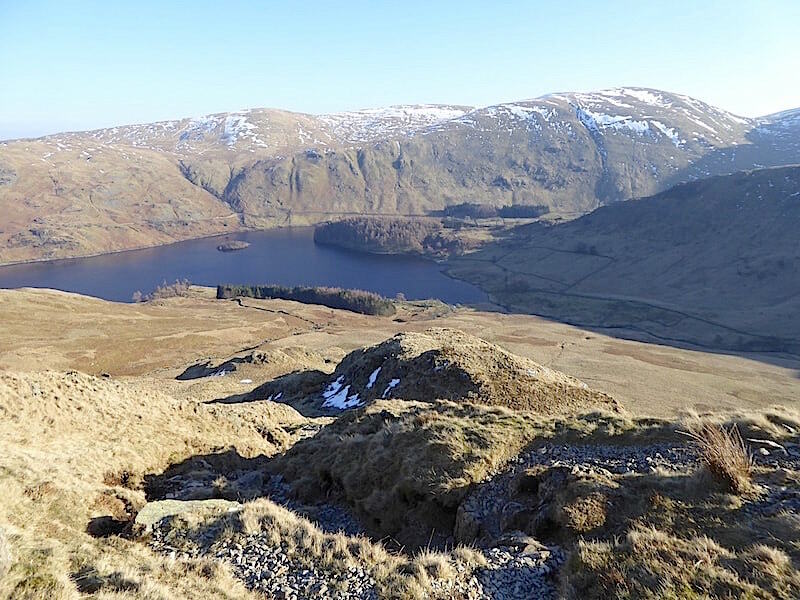 The little promontory named Speaking Crag jutting out into Haweswater as we make our way over to The Rigg …..
….. and from the path a look back across to Kidsty Howes, on the left, with Whelter Crags to their right and below them are Birks Crag, Lady’s Seat and Castle Crag, with Randale Beck winding its way down to Haweswater amongst them all. 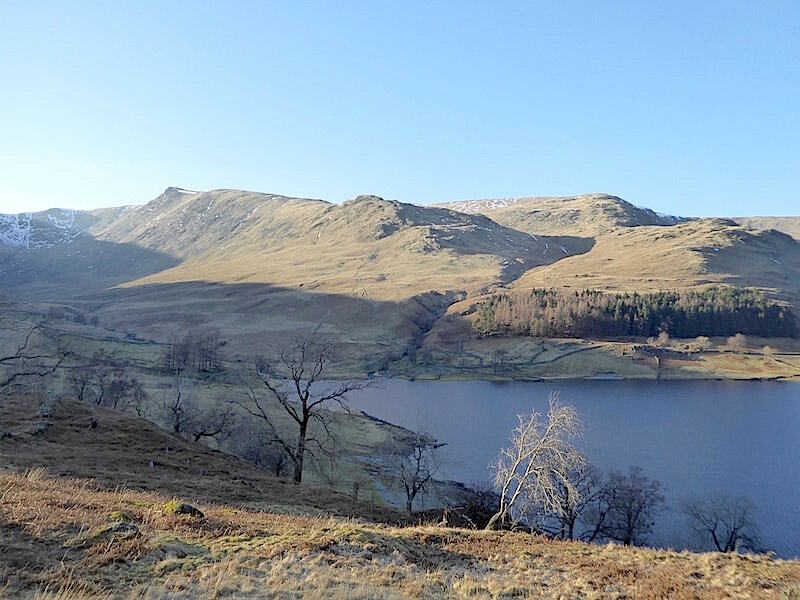 Speaking Crag and Haweswater as we climb up to The Rigg, followed by a couple of lovely views just to round off our walk …..
….. mellow afternoon light on Speaking Crag and the lower slopes on Haweswater’s western shore …..
….. and Kidsty Pike and Kidsty Howes still enjoying their time in the sun. 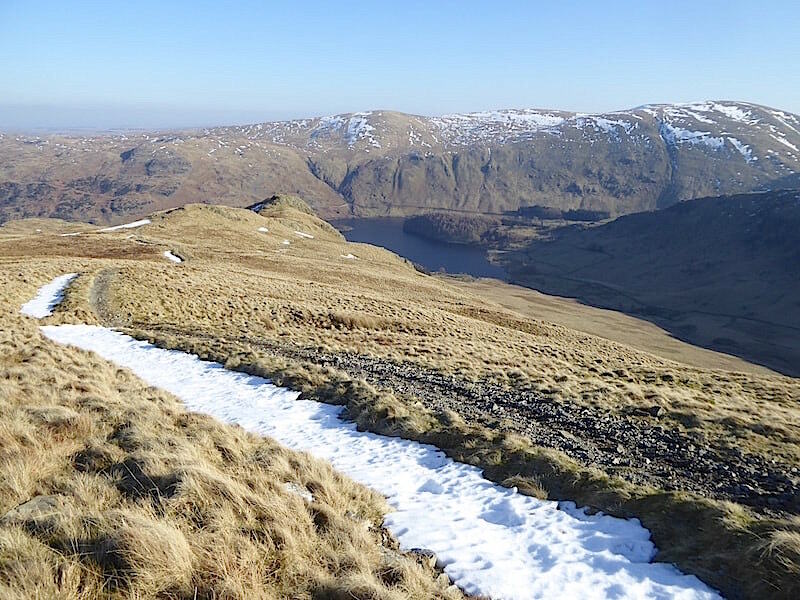 We dropped down from The Rigg onto the western shore footpath and made our way back to Mardale Head with the sun blazing down directly ahead of us. Across the water there are still plenty of cars in the car park even though we have been seeing quite a number heading back along the road as we walked the shoreline path. The roadside parking must have stretched quite a long way down the road today, and why not because its a lovely place for a gentle Sunday afternoon family stroll with the kids and the dogs. 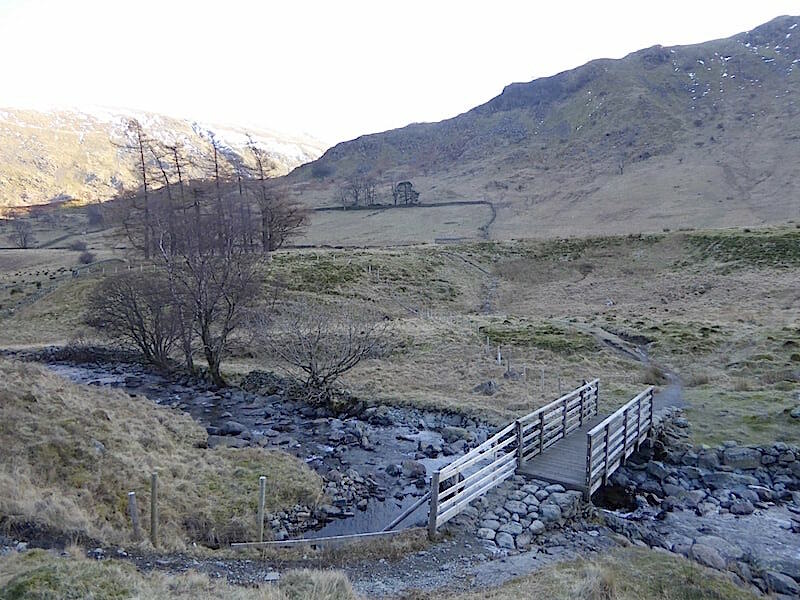 We’re almost at the end of our walk now as we cross the footbridge over Mardale Beck and head up the rise back to the car park …..
….. from where I took a shot of the same view as I did at the beginning. 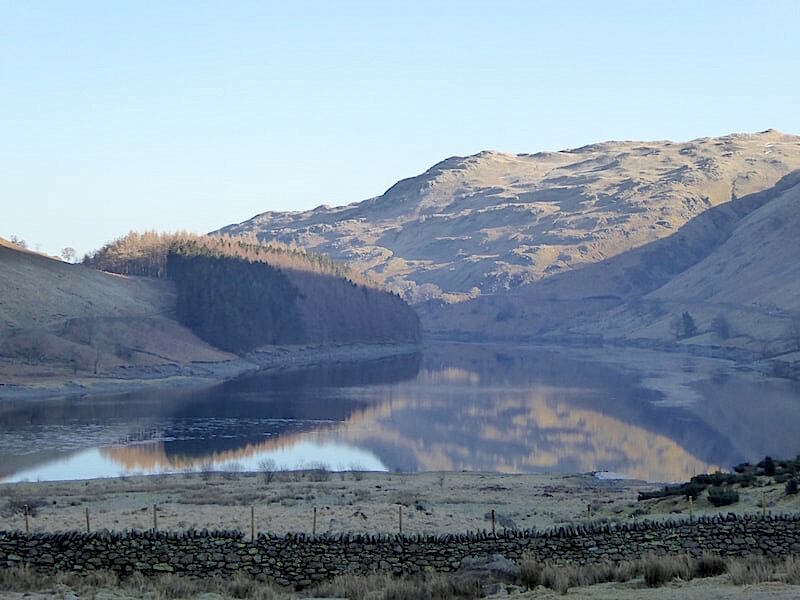 It looks much more welcoming with the afternoon sun on The Rigg and Brown Howe, and the blue sky reflected on the surface of the now ice free and gently rippling water. 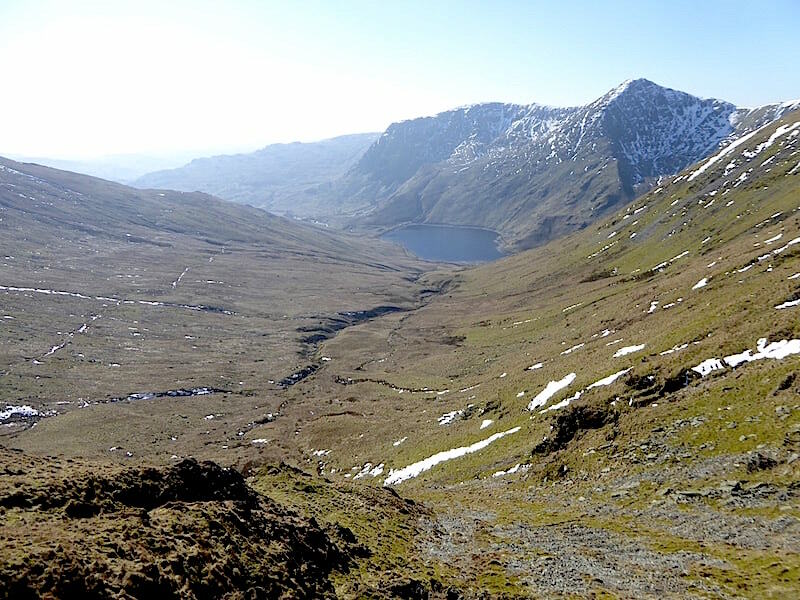 Walkers are returning to their cars from all directions, divesting themselves of packs and boots, quenching thirsts and flopping onto car seats and no doubt recalling moments from their walks on the journey home, just as we will. 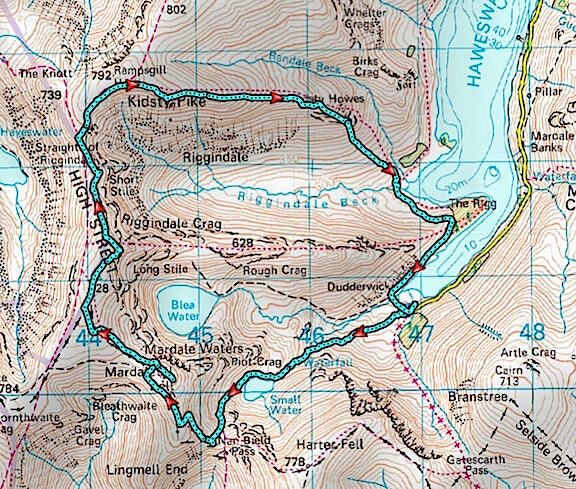 I mentioned earlier that the gps was still misbehaving today just as it did on our last walk a few of days ago and the chief technician has been growing increasingly frustrated with it. Once we were home the gadget was closely inspected and the problem identified, namely a sliding clip holding the tiny chip in place which had slid out of its moorings leaving the chip somewhat adrift and therefore not displaying information properly on the screen. Now that we know what the problem is we have to figure out a way of making sure that the clip stays in position. Wonder if we have any industrial strength gaffer tape lurking in the garage?